Note: Medals and tokens on this page are not shown to scale. The actual size is given in the text where known. 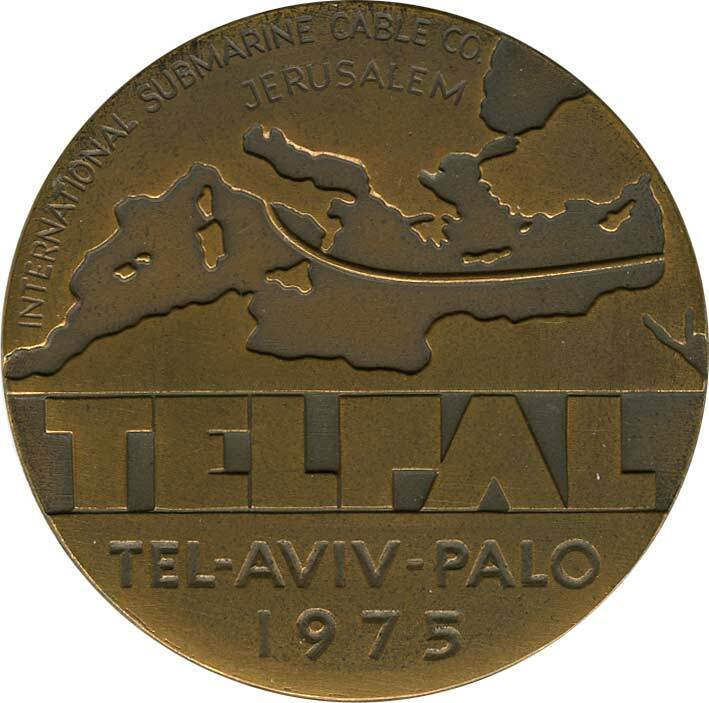 If you have a cable medal or token not shown on this page, please contact me. 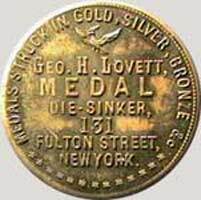 The Cyrus Field medals above and below were struck by George Hampden Lovett of New York in bronze and white metal. For further information on Lovett, one of a family of 19th century medal and token makers, see the Lovett Tokens & Medals website. 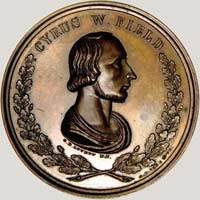 The medals shown here are copies of the gold medal presented to Cyrus Field by the merchants of New York, which was still in his possession at the time of his death. 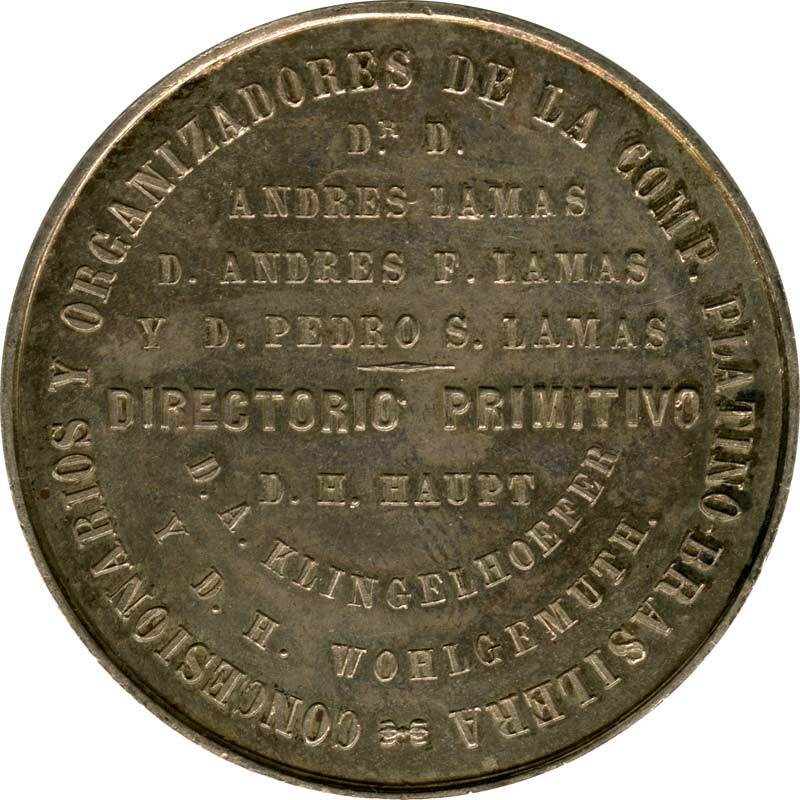 The gold medal was left in his will as part of a group of items to be divided among his children. 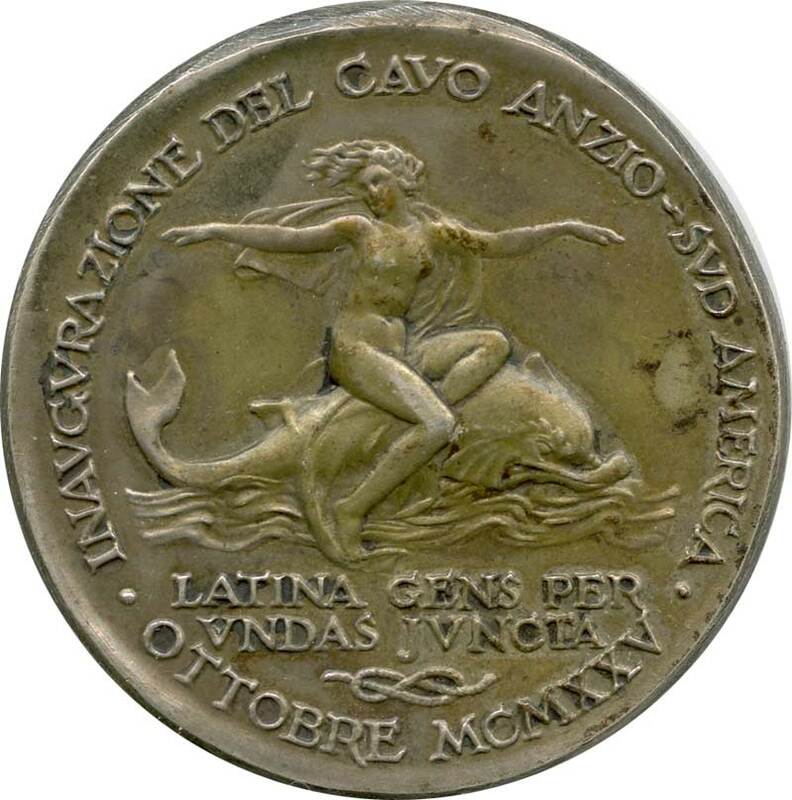 The Latin motto around the reverse translates as, “Never Despair. Perseverance Conquers,” referring to the three attemps to lay the cable before the success of 1858. 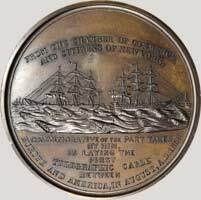 There are two versions of the wording on the reverse of these medals, as noted; with minor variations in the text, and with and without the Aug. 5th 1858 date. Medals struck in gold, silver, bronze &c.
The flaw on the reverse of the undated medal below is in the die; it appears on both the bronze and white metal versions. 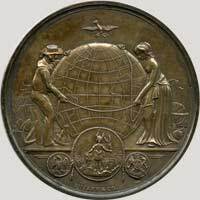 The obverse side bears a globe supported by figures of Science and Navigation. A dove hovers over the globe, bearing an olive branch in her beak. Navigation is symbolized by a background sculptured with ships, anchors and sextant; and Science has a similarly appropriate surrounding. 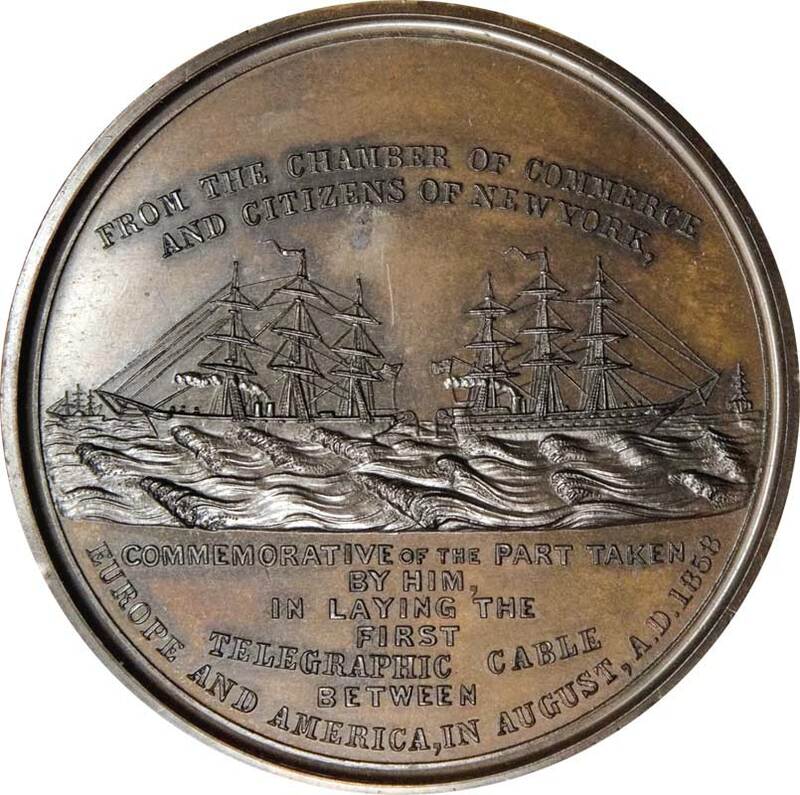 The seal of the Chamber of Commerce, between the arms of the two countries, is to be seen below. Richard Williamson, Asst. Engineer. R.N. 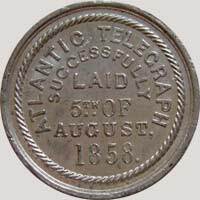 Europe and America, in August, AD 1858. 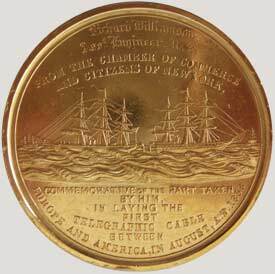 After the successful completion of the Atlantic cable in August 1858, by order of the Chamber of Commerce of New York, Tiffany & Company made commemorative medals in gold, each engraved with the name of one of the members of the cable expedition who had sailed on the ships of the cable fleet: Niagara, Agamemnon, Gorgon and Valorous. Two sizes and weights of medal were made, both in the purest gold; nine of 2¾" (70mm) diameter, each weighing five ounces, were presented to the expedition’s principals, and approximately fifty medals of about 2¼" (58mm) diameter, each weighing three ounces, were presented to the other crew and staff of the cable fleet. The page on Richard Williamson, who was awarded the gold medal shown above for his part in the cable expedition, has further details on these medals, including a list of the recipients and notes on the very few other gold medals still known today. 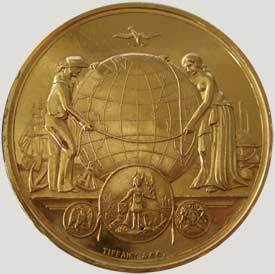 Copies of the medal were also struck by Tiffany in bronze for general circulation. 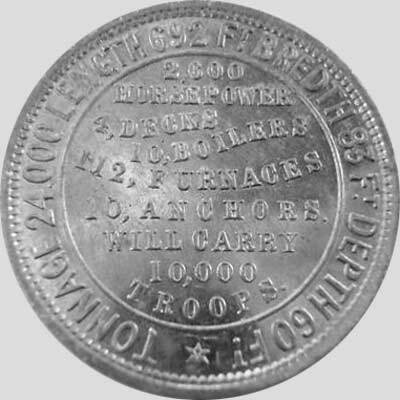 58mm, 115.4gm. 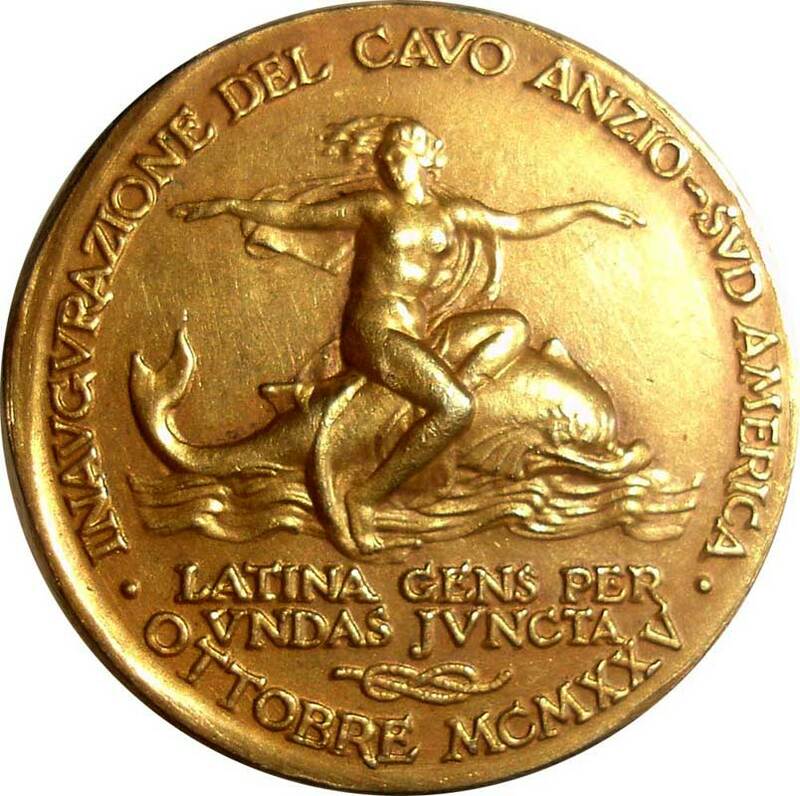 Two different designs of the obverse are known; one (above) is the same as the gold medal; the other (below) has different figures and motifs. The location of the medal given to Henry A. Moriarty, Master of H.B.M.S. Agamemnon is not known, but an electrotype of the original survives (below). 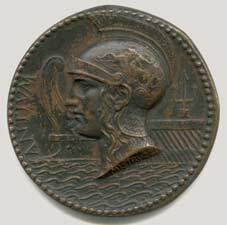 An electrotype of a coin or medal is made by a process first developed in the late 1830s. 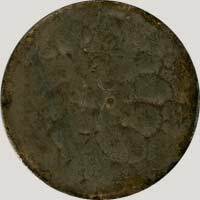 A mould is made from each side of the original using wax, plaster of paris, or a similar material. To make the mould conductive its inner surface is brushed with powdered graphite, and a wire is then pressed through the back of the mould to connect with the graphite coating. Using a battery, copper is plated onto the mould until a suitable thickness has been achieved. Gold and silver can also be plated into the mould. The electrotype is removed from the mould, and its surface may then be treated with various chemicals depending on the finish desired. 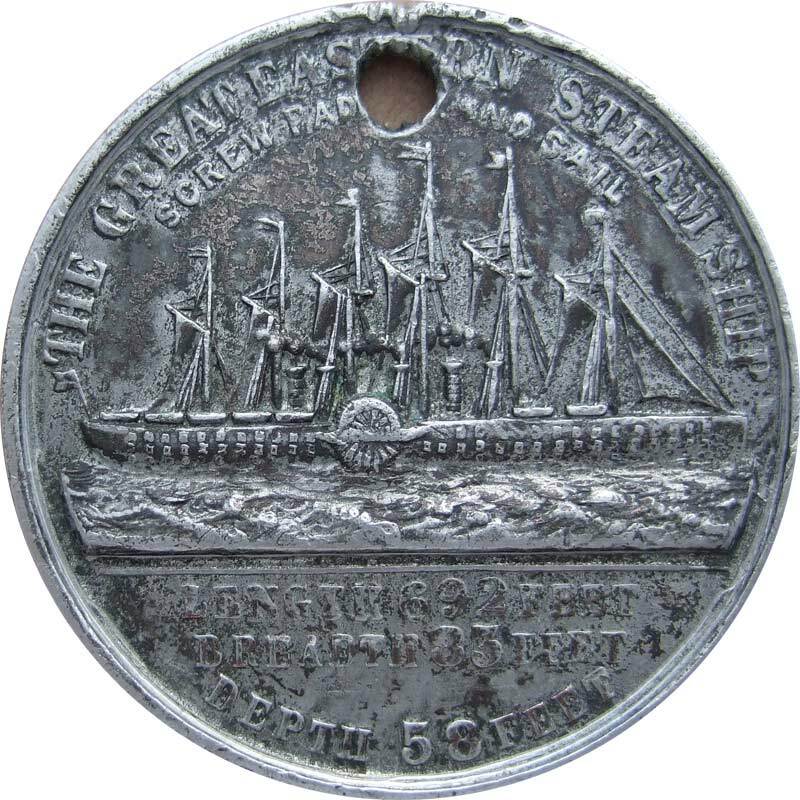 The thin electrotype is usually filled with lead for stability, as can be seen on the right-hand image below of the reverse of the medal. 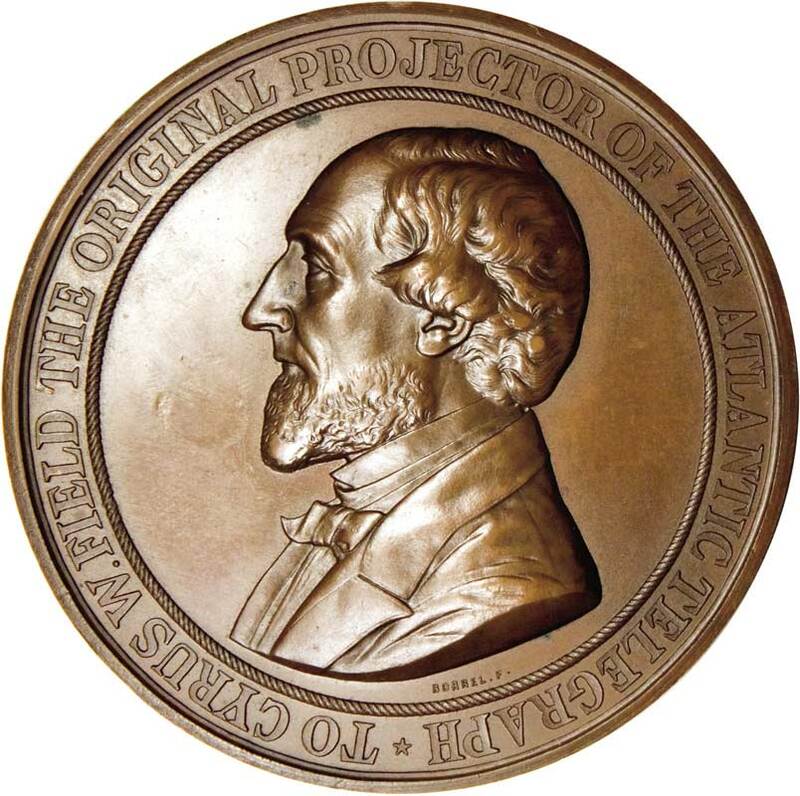 The obverse electrotype, shown in the left-hand image, has been left as it came from the plating bath. 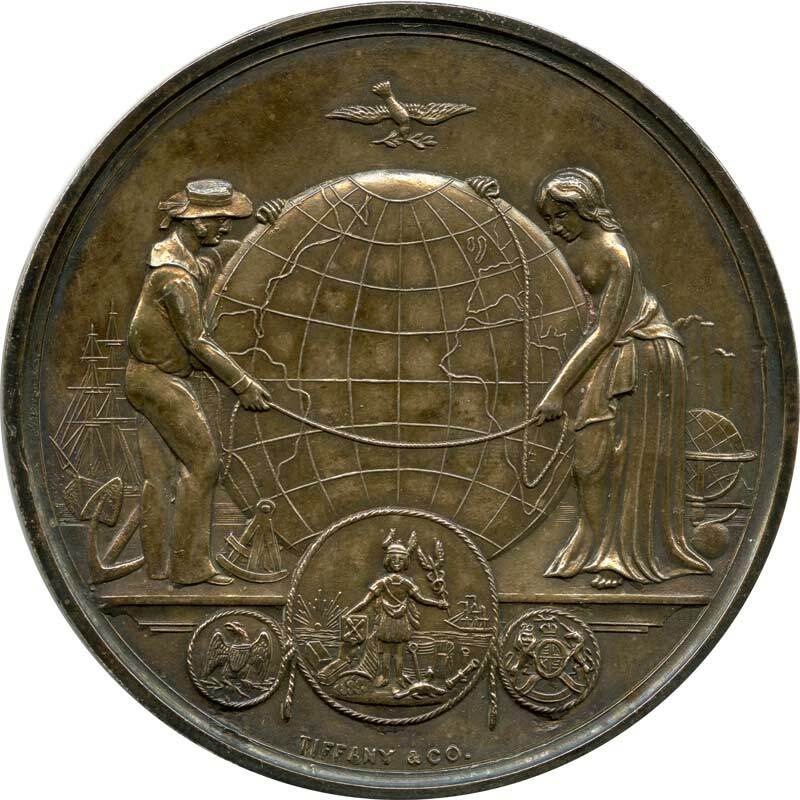 The two electrotypes could either be joined to make a facsimile of the original medal, or mounted side by side for display purposes. 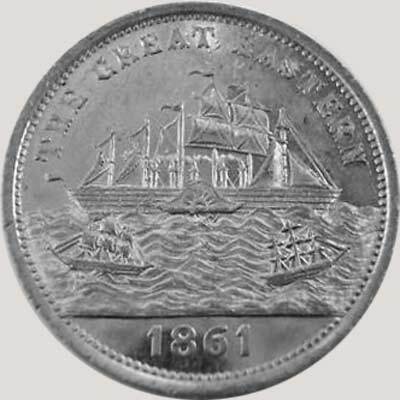 George H Lovett made a variety of these tokens in 1858, in silver, copper, brass, and white metal. 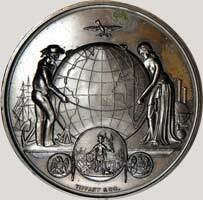 The obverse shows John Bull and Brother Jonathan exchanging lightning bolts across the ocean, with a ship laying cable between them; the most commonly seen reverse has the date of the landing of the cable.. Some examples have Lovett’s “Medal Die-Sinker” advertisement on the reverse. 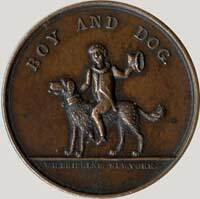 Others have “Boy and Dog/W.H. 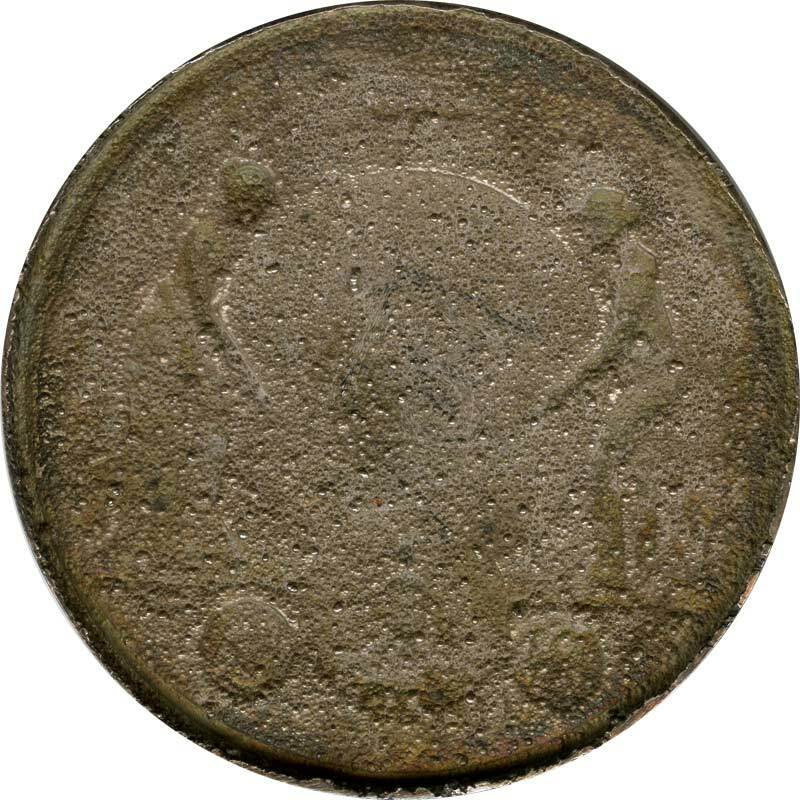 Bridgens New York”* on the reverse, with an image of a boy riding a dog. *Another, unrelated, William H. Bridgens token lists him as “Bridgens/Metal Tokens/&/Store Cards/189/William St”. 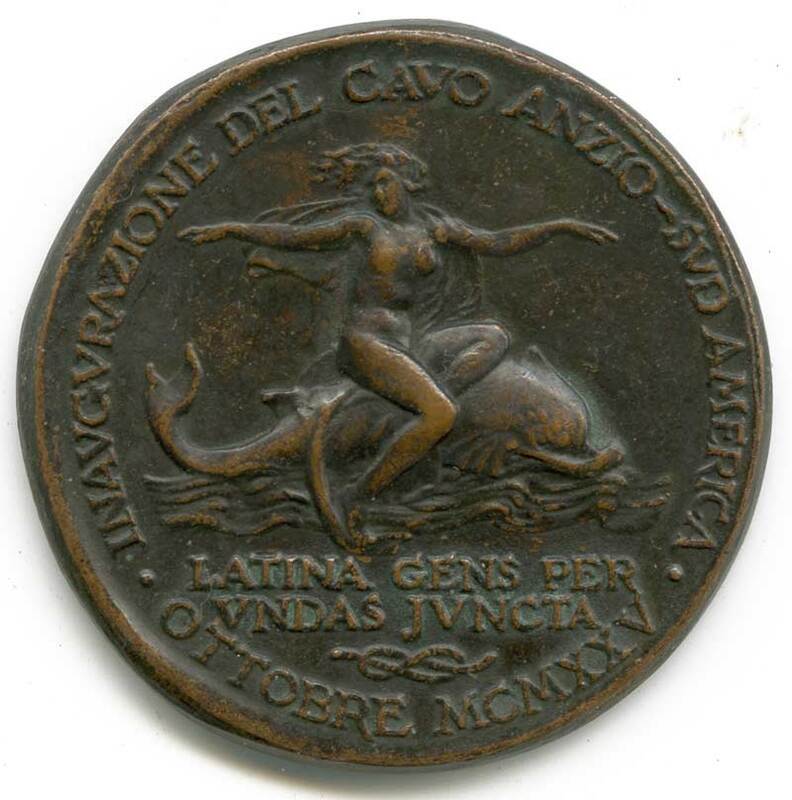 The catalogue entries of the American Numismatic Society for two Boy and Dog tokens with a different obverse record the name as W.S. 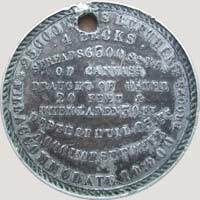 Bridgens, but on close inspection the example above clearly shows the second initial as H.
This token, issued by Granville Stokes to promote his clothing business in Philadelphia, incorporates a section of the 1858 cable, and at 6mm (¼") is much thicker than a normal token. See side view below. What grows less tired the more it works? Pretty good. 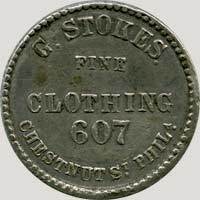 But better yet to the hundred thousand readers of the Inquirer the important fact that the Palatial Clothing Establishment of Granville Stokes, No. 607 Chestnut street, has an elegant suit, a splendid over-coat, a fashionable frock or dress coat, an unapproachable vest, or a fascinating pair of pants, for each one of them, with the largest and best selection of elegant fabric from which gentlemen may make selections, to be found on this Continent. Call and try him. Stokes’s Atlantic Cable Charms given away. 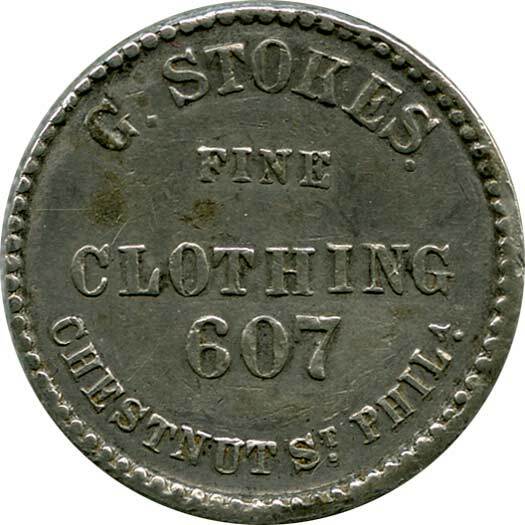 Stokes did business in Philadelphia from 1843 to 1865, and issued one other token, in 1862: “Merchant Tailor”, “Fine Fashionable Clothing”. 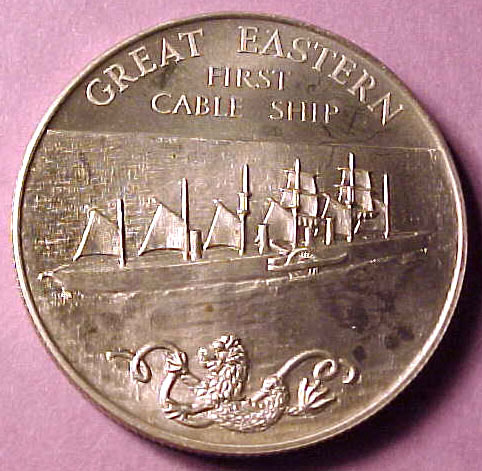 The obverse shows the shields of the United States and Great Britain with a trident and lightning bolts between and laurel branches below, the various elements linked by an intertwined cable. 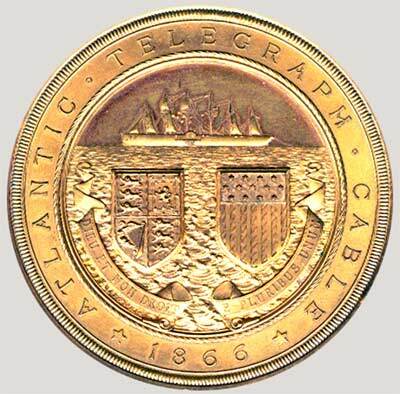 The Latin motto on the reverse, “Finis Coronat Opus,” generally translated as “The End Crowns the Work,” refers to the several attempts to lay the cable (in 1857, 1858, and 1865), before success was finally achieved in 1866. 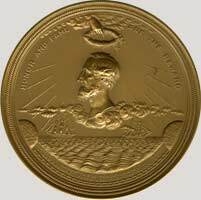 The medal maker, Pinches, London, was founded by John Pinches (1825-1905) in 1840, and continues in business today as part of the Franklin Mint. From The State of Wisconsin. 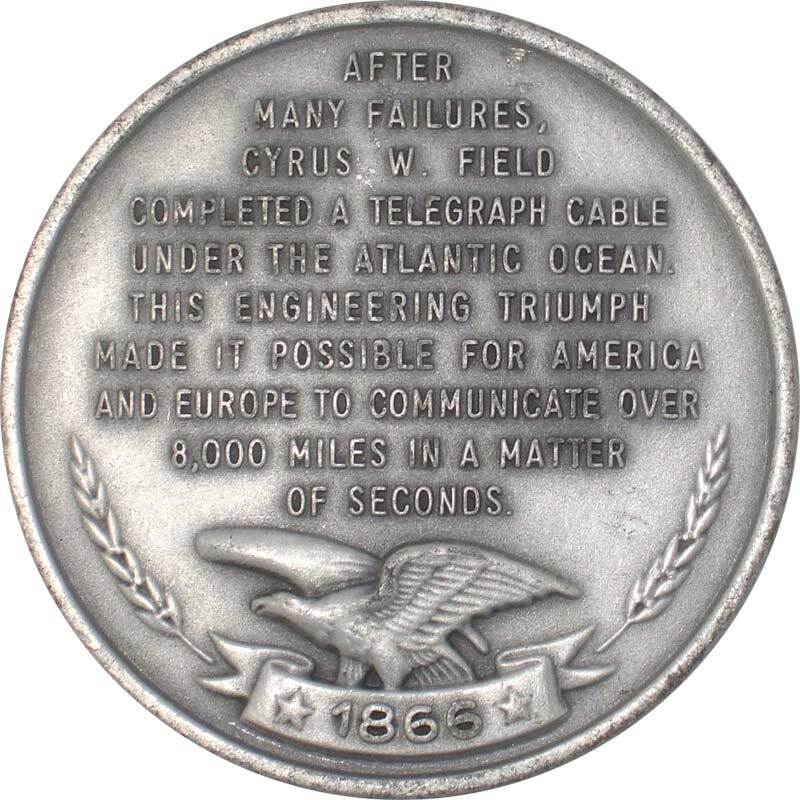 1867 From the State of Wisconsin to Cyrus Field. 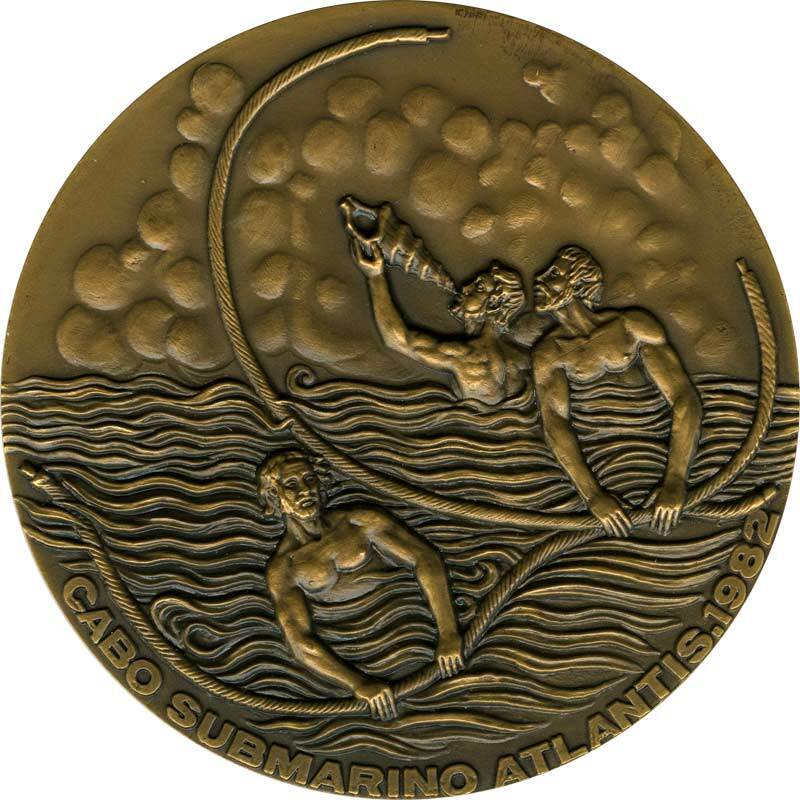 Bronze, 65.5mm, 132.8gm. 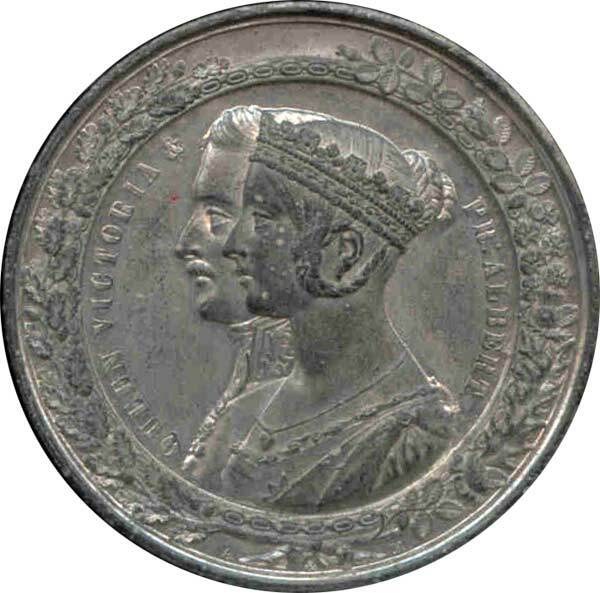 Marked “Borrel Fecit” on both obverse and reverse, and struck by Tiffany & Co. 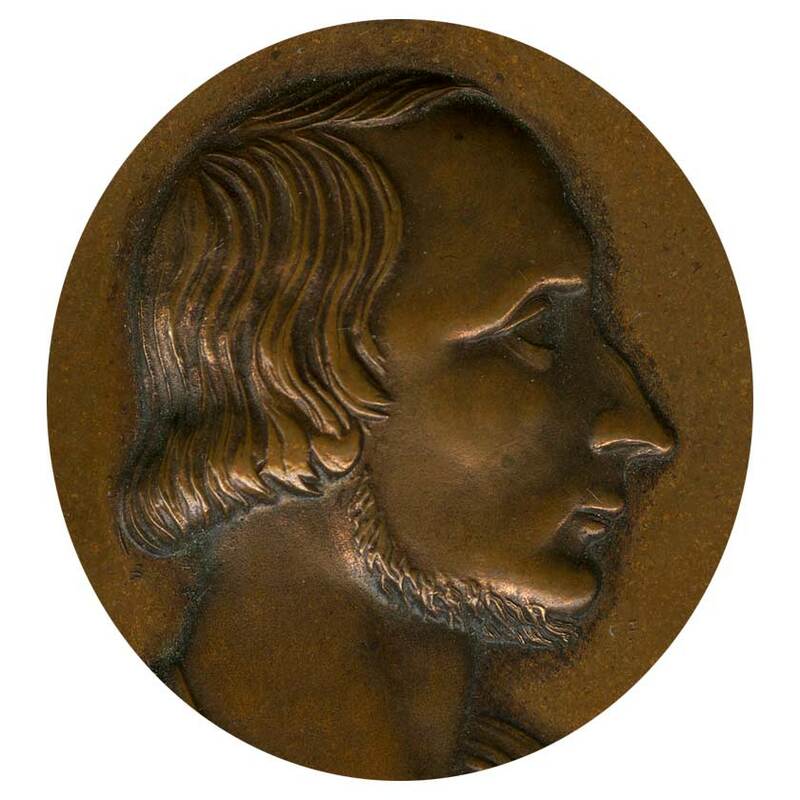 The engraver was Valentin Maurice Borrel (1804-1882). This is a copy in bronze of the gold medal presented to Cyrus Field by the State of Wisconsin, which was still in his possession at the time of his death. The gold medal was left in his will as part of a group of items to be divided among his children. 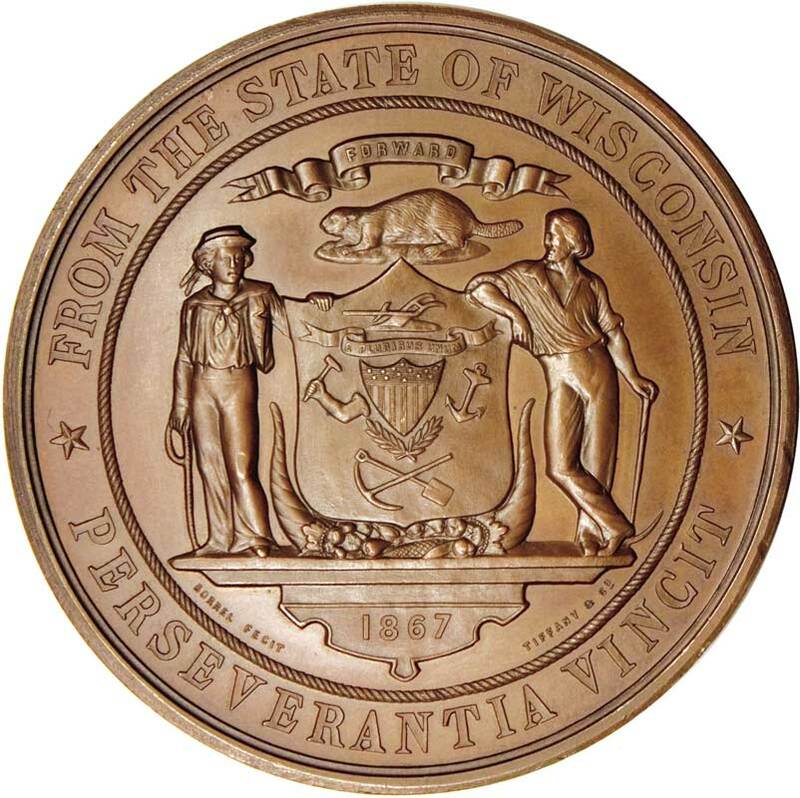 Six bronze copies were also made and distributed, including one to Governor Lucius Fairchild, whose heirs donated it to the State Historical Society of Wisconsin. 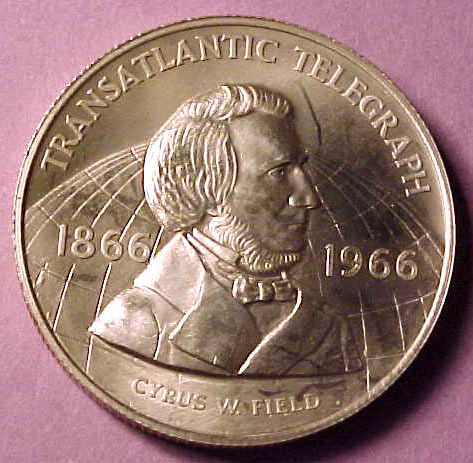 The obverse depicts Field facing left and has the wording: “To Cyrus W. Field The Original Projector of The Atlantic Telegraph”. 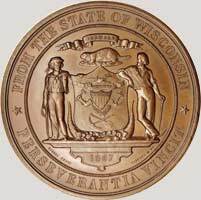 The reverse depicts the coat of arms of Wisconsin and has the wording: “From The State of Wisconsin. 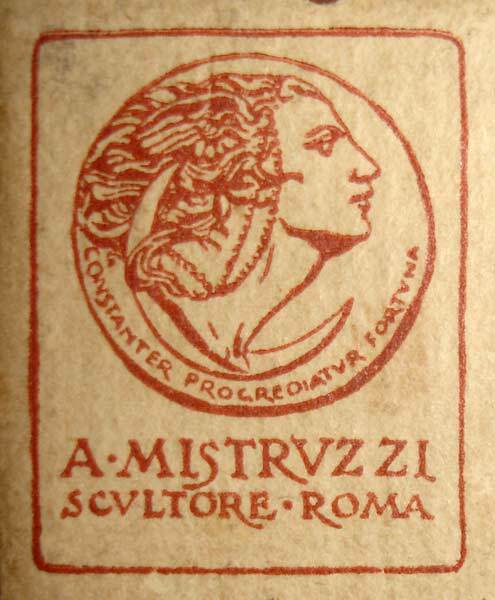 Perseverantia Vincit” (compare with the 1858 Lovett medal above). 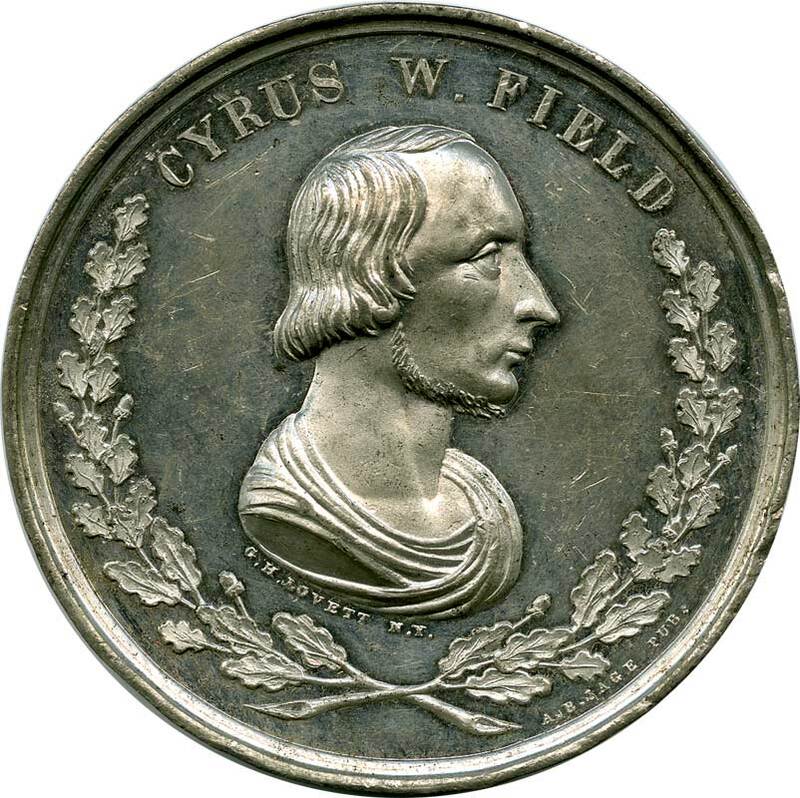 In 1867 the Legislature of the State of Wisconsin passed a joint resolution authorizing Governor Fairchild to prepare a suitable medal for Cyrus Field. [An Illustrated History of the State of Wisconsin by Charles Richard Tuttle, page 605]. 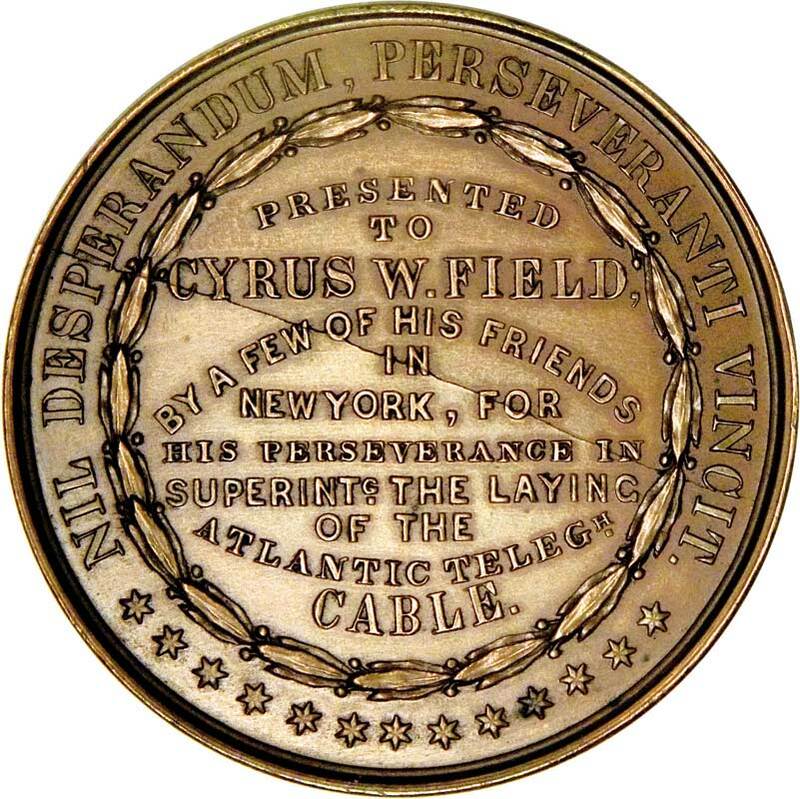 In obedience to joint resolution number ten, 1867, I have caused to be prepared and transmitted to Cyrus W. Field a suitable gold medal, in recognition of his distinguished services in connection with the successful completion of the Atlantic cable. Executive Chamber, January 14, 1869. 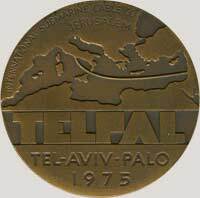 The medal is bronze with a heavy gold plating, 76mm in diameter, 206.8 grams. The American Chamber of Commerce at Liverpool resolved some months ago that a gold medal should be made and presented by the Chamber to Sir Samuel Canning, chief engineer; Mr. Cyrus W. Field, of New York, the original projector of the Atlantic Telegraph; Sir James Anderson, the Commander of the Great Eastern steamship; and Mr. Willoughby Smith, the electrician, in commemoration of the successful laying of the Atlantic Telegraph cable. 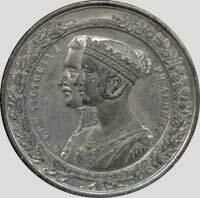 The medal above was presented to Sir Samuel Canning. 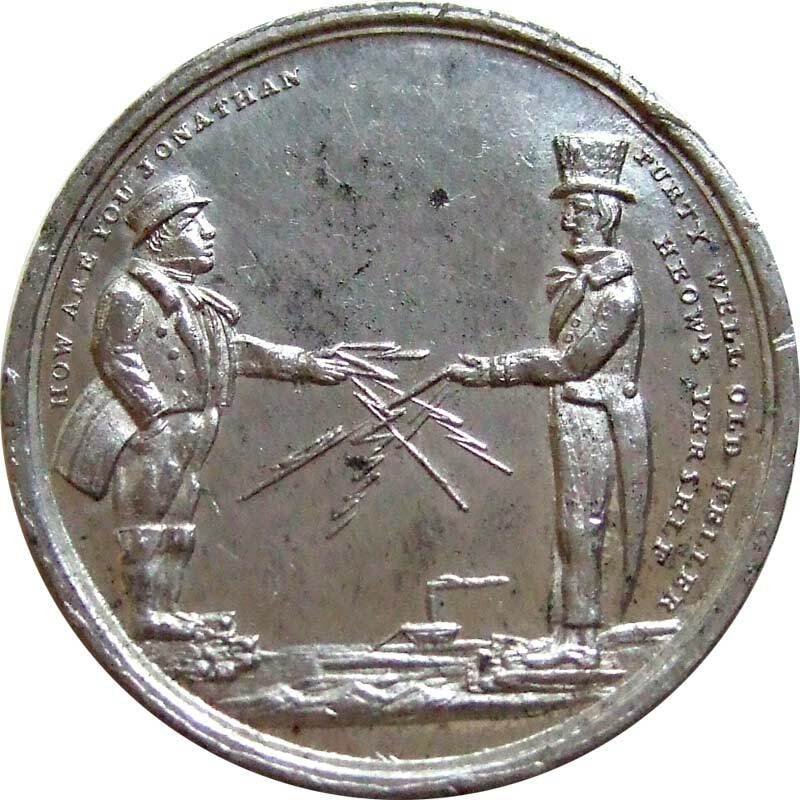 The full story of this medal, which belongs to Herman Blanton and is shown here by his kind permission, may be seen on this page. 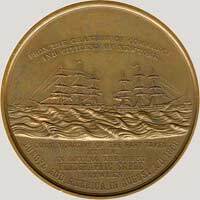 The National Maritime Museum has an uninscribed, silver-frosted copy of this medal. The Metropolitan Museum of Art has Cyrus Field’s gold medal, and also one in gilt bronze. 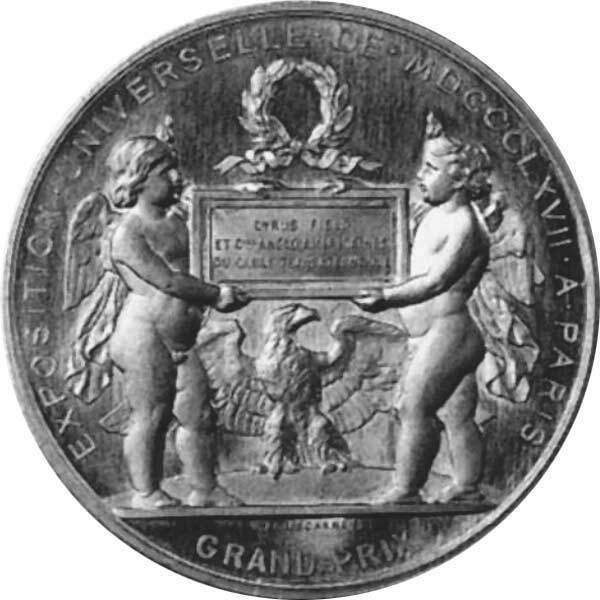 The laurel-wreathed head of Emperor Napoleon III, facing left, and the signature H. PONSCARME F.
Two putti support an inscribed panel with a laurel wreath above and an eagle as an emblem for France below. 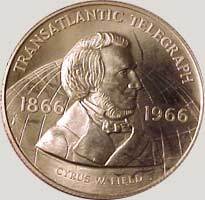 This GRAND PRIX medal was awarded at the Paris Universal Exposition in 1867 to Cyrus W. Field and the Anglo-American Telegraph Company for laying the transatlantic cable from Ireland to Newfoundland in 1866. François Hubert Ponscarme, 1827-1903, was a French medallist and sculptor. 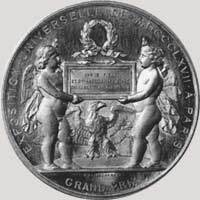 The Grove Dictionary of Art notes that “the prize medal he executed for the Exposition Universelle in Paris of 1867 was very well received...”. 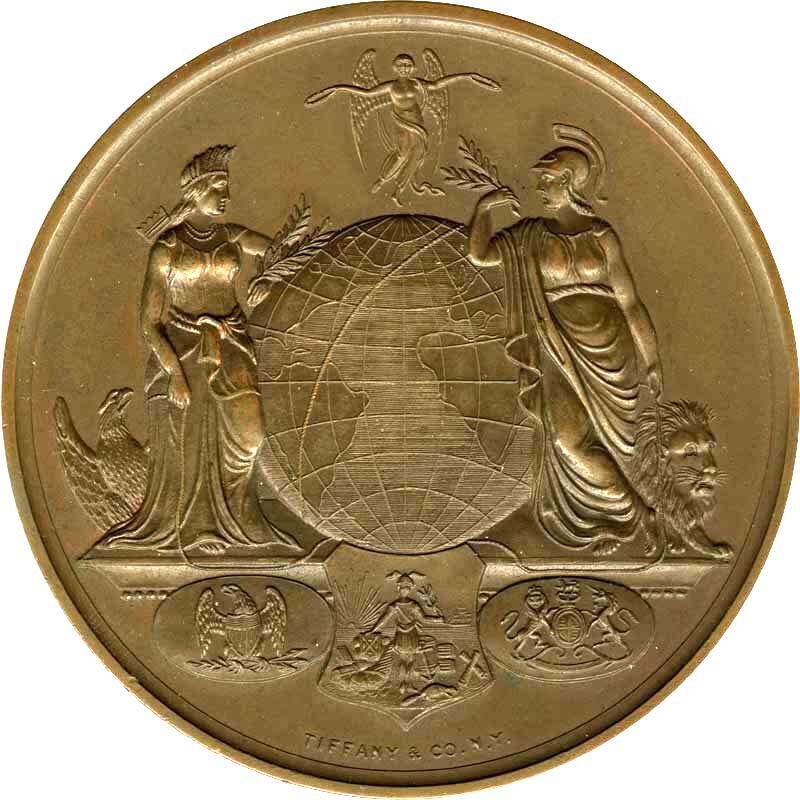 The design was used for all the medals at the 1867 Exposition, the panel being inscribed according to the award. 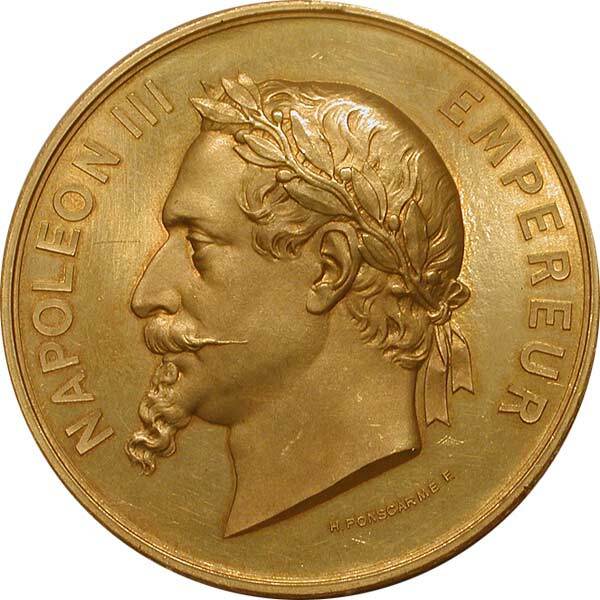 The medal was also struck in bronze at the same size, with the recipient’s name in the tablet and “POUR SERVICES RENDUS” replacing “GRAND PRIX” at the bottom of the medal, and in gold of diameter 51mm with the legend “RECOMPENSES”. 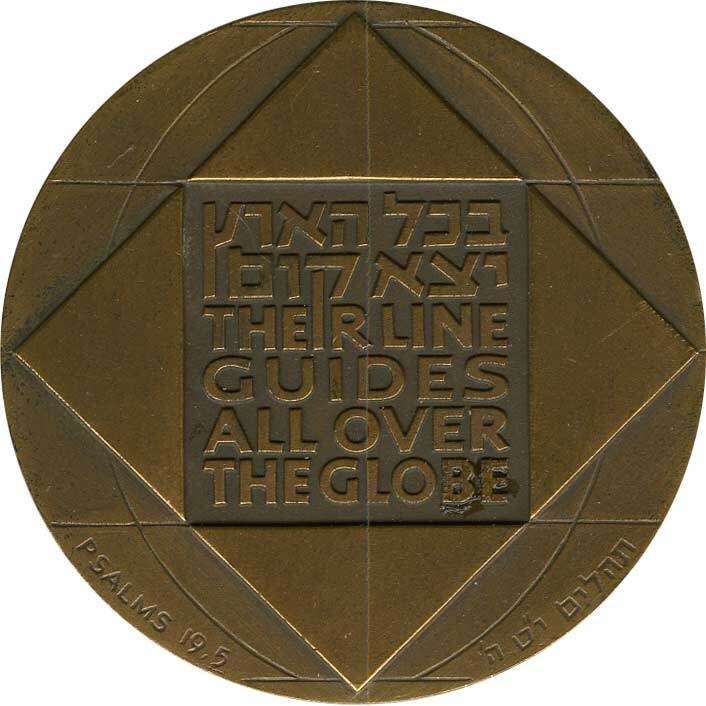 There was also a 37mm version in bronze with a different reverse design. 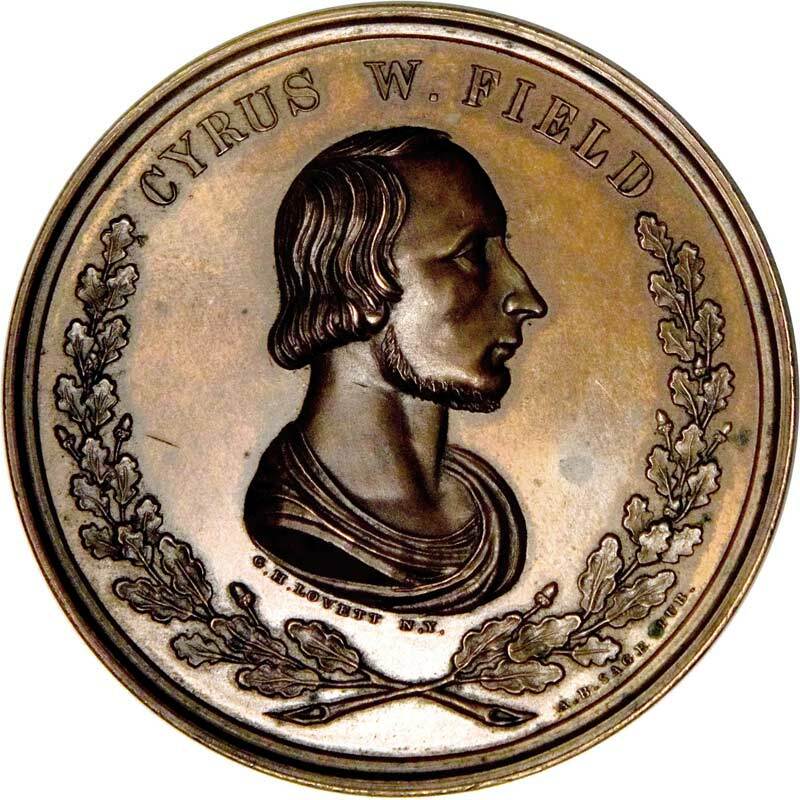 Cyrus Field’s gold medal was donated by him in 1892 to the Metropolitan Museum of Art in New York, together with many other works from his collection. Some information in this section is from The Metropolitan Museum of Art Bulletin, New Series, Vol. 56, No. 3, Winter, 1998-1999. 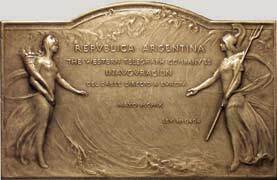 Charlotte Gere: “European Decorative Arts at the World’s Fairs: 1850-1900”. Honor and fame are the reward. Indomitable perserverance and enduring faith achieved the success. By resolution of the Congress of the United States, March 2 1867, to Cyrus W. Field of New York for his foresight, faith and persistency in establishing telegraphic communication by means of the Atlantic Telegraph connecting the old with the new world. 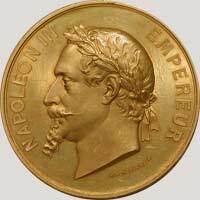 The original of this medal, measuring 103mm and weighing almost 27 ounces, was struck in gold and awarded to Cyrus Field in 1868. It was still in his possession at the time of his death and was left in his will as part of a group of items to be divided among his children. 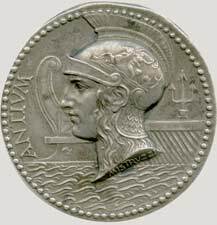 In 1868 the Mint struck 103mm versions (matching the size of the gold medal) in aluminum (then a precious metal) and bronze; these are referenced as Julian PE-10. The 103mm medal was re-struck by the Philadelphia mint in yellow bronze in the 1950s. 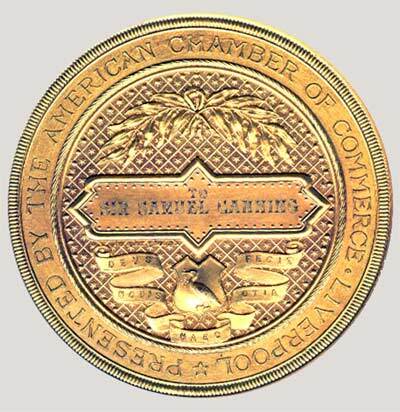 The images here are of the yellow bronze replica issued by the United States Mint for general circulation in the 1960s. 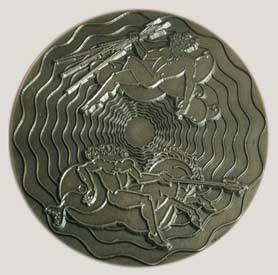 This version of the medal is 76mm (3") in diameter, US Mint medal number 625. 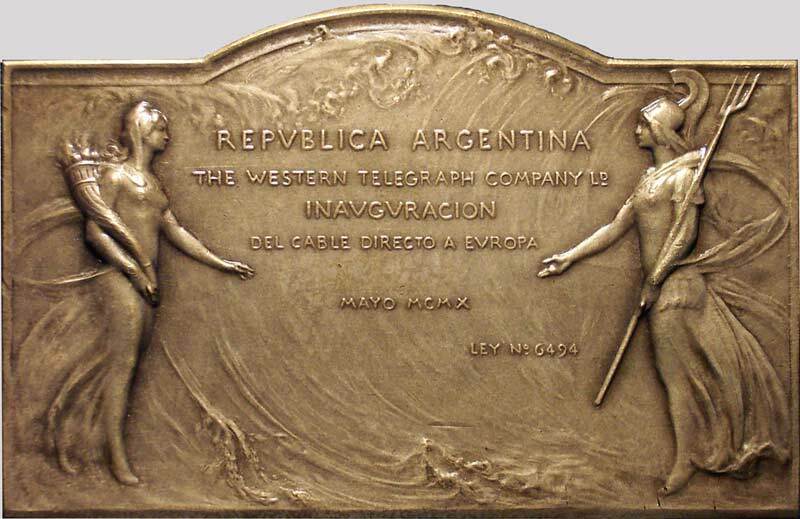 Inaugural medal for the River Plate cable of the Companhia Telegrafica Platino-Brasilera, made and laid in 1874 by Siemens Brothers, London. 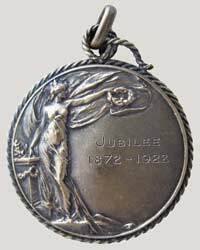 The medal is marked A.M under the date on the obverse. Gustavo Coll notes that the medal shows the emblems of Brazil, Argentina and Uruguay on the obverse (clockwise from top), while the reverse shows the name of the founders and those of the first Board of Directors. 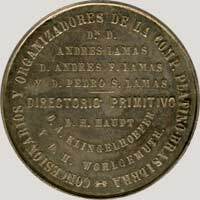 Andres Lamas was a prominent Uruguayan politician and diplomat. 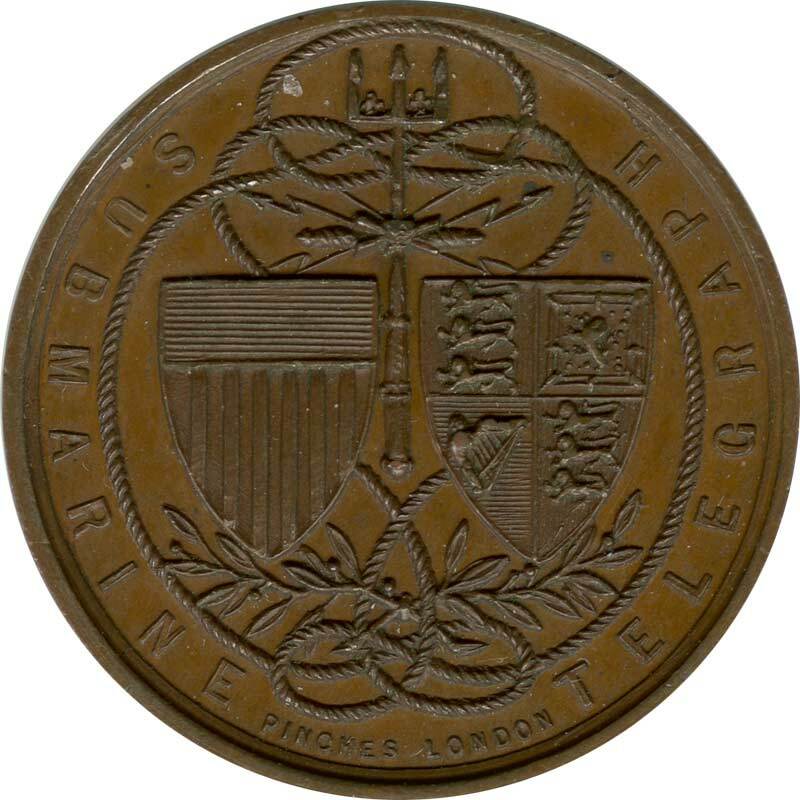 THE WESTERN TELEGRAPH COMPANY LD. 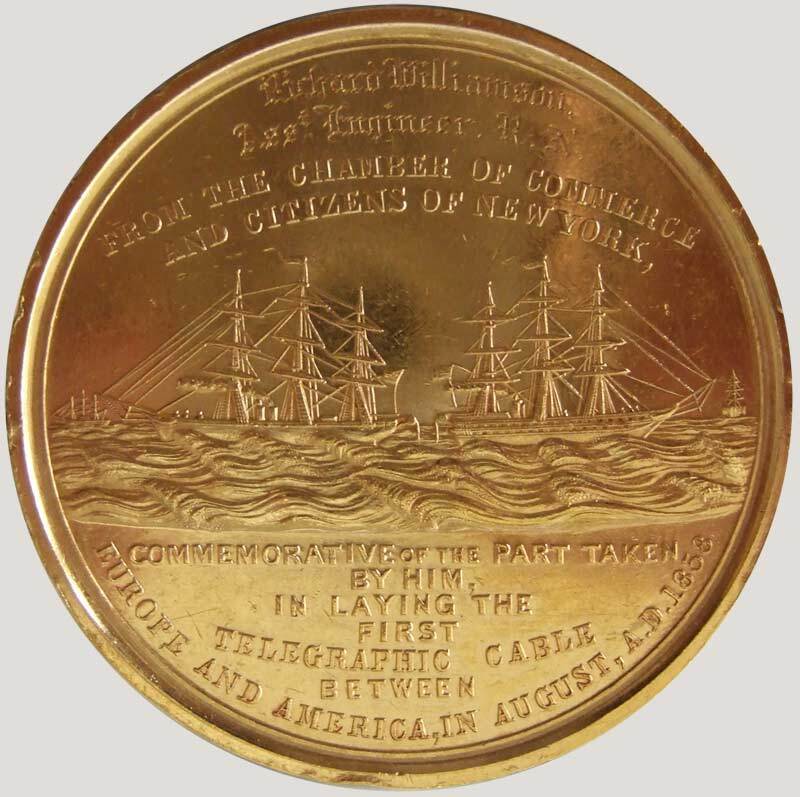 Medal commemorating the opening in May 1910 of the first direct telegraph cable between Argentina and Europe, operated by the Western Telegraph Company Ltd.
The1910 cable ran from St Vincent - Ascension - Buenos Aires, connnecting at St Vincent with the cable to Madeira laid in 1901, and also to the 1906 cable to Fayal, Azores, which connected to Carcavelos and Porthcurno. The designer of the medal was the French artist Octave Denis Victor Guillonnet and it was engraved by Stern of Paris. 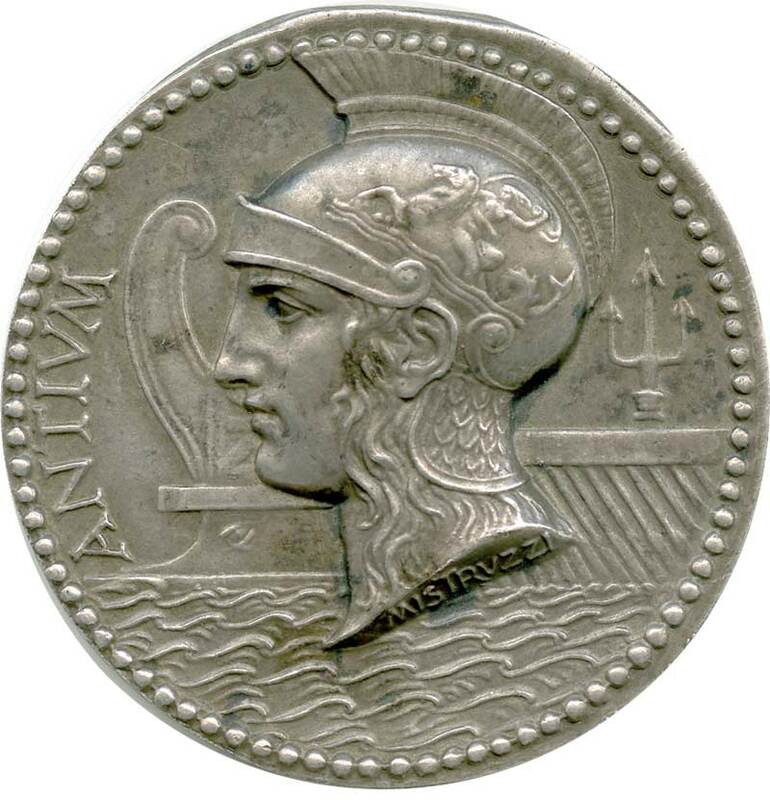 Obverse: On a background of waves two females in classical dress. 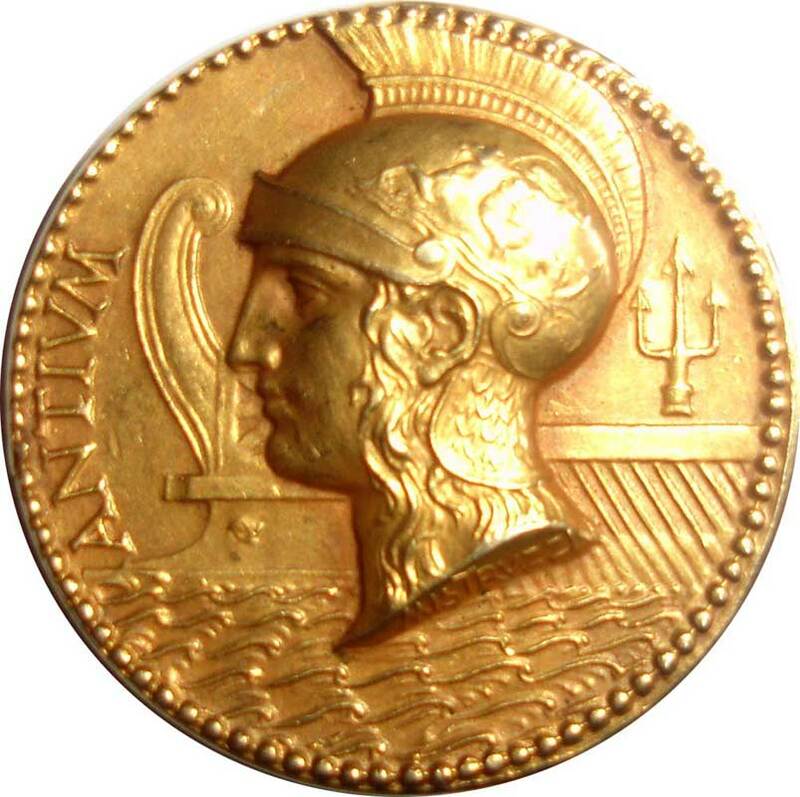 On the left Argentina (right), left hand slightly forward, in her right hand a cornucopia; on the right, helmeted Europa (left), right hand forward, in her left hand a trident. 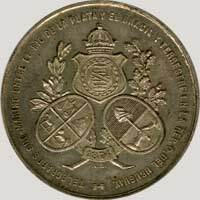 Reverse: Divided into three panels (from left to right): In the left panel are objects symbolic of Argentina—caduceus, coat of arms within encircling branches, scythe, cow’s head, cornucopia. 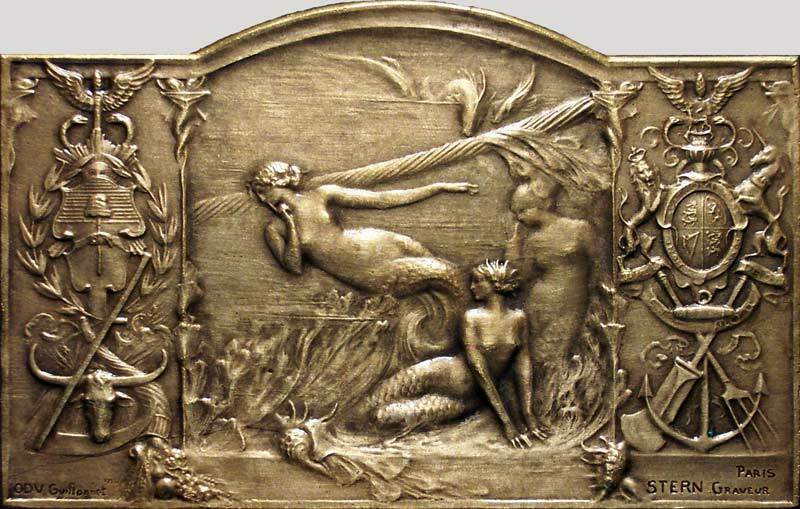 In the centre panel are mermaids, the cable behind. 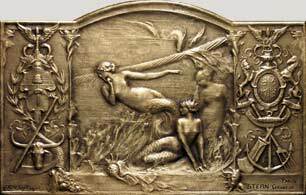 The right panel shows objects symbolic of Europe—caduceus, the British Royal arms, an anchor behind a crossed steering oar and trident. 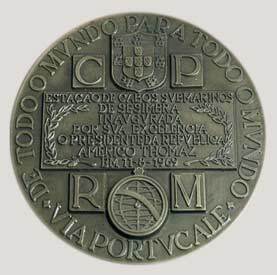 The images of this medal are courtesy of Gustavo Coll. 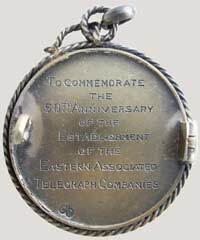 In 1872 the Eastern Telegraph Company and the Eastern Extension, Australasia & China Telegraph Company merged to form the Eastern & Associated Telegraph Companies, and many smaller companies under John Pender’s control were also incorporated into the merged entity. In 1922, on the 50th anniversary of the formation of the group, a jubilee celebration was held in London and a commemorative book was published by the company: Fifty Years of "Via Eastern". 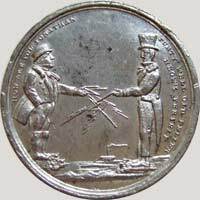 There is no mention of a Jubilee medal in the book or elsewhere, and the history of the medal shown here is unknown. As can be seen from the photo of the reverse, the medal has been mounted as a pin or brooch at some point. 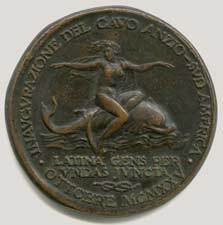 Inaugural medal for the Italcable cable system from Anzio, Italy, to South America. The project was started in 1924 and completed in 1925. 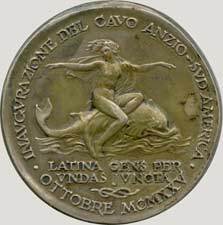 The medal was sculpted by A[ngelo] Mistruzzi of Rome; his name is engraved at the base of the bust on the obverse. 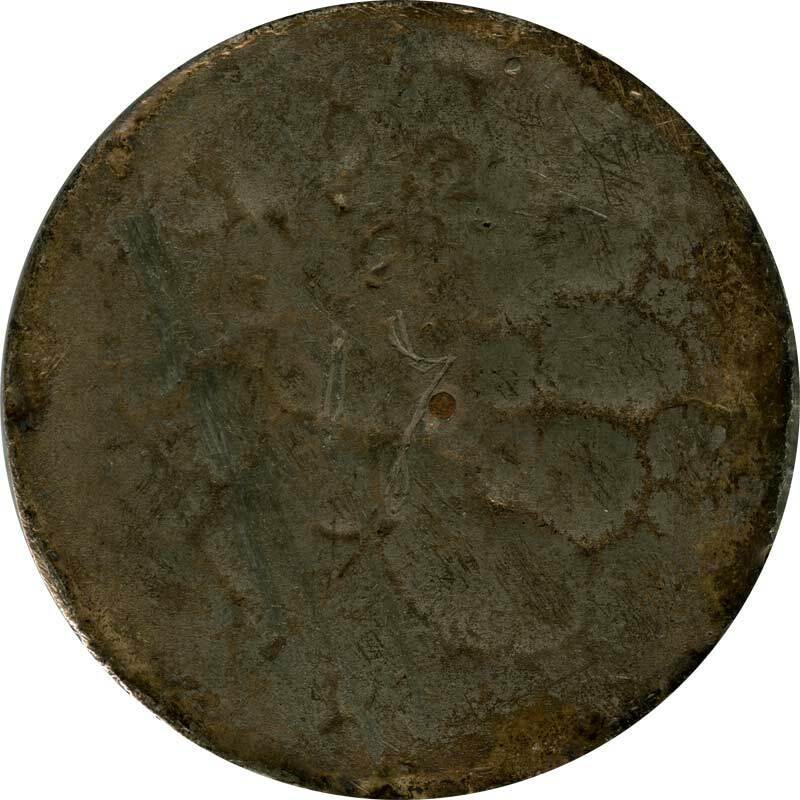 The 22mm medal was struck in gold, silver, and bronze; the American Numismatic Society catalogue records 36mm and 85mm bronze versions, and the 36mm size was also made in silver. An 85mm medal appears to have been struck only in bronze. The images of the gold medal are courtesy of Miguel Santos. 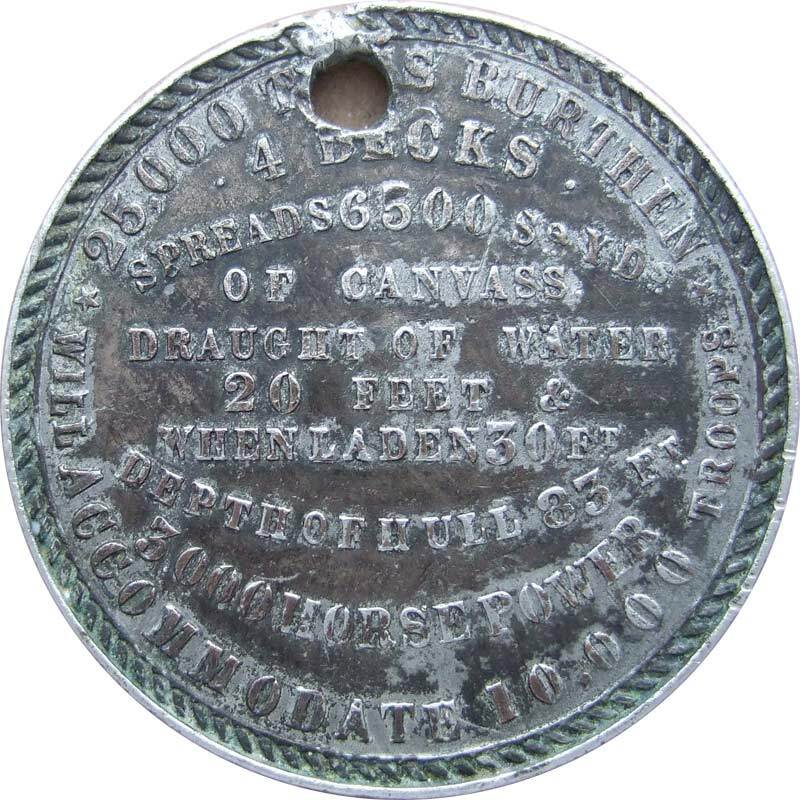 As noted in the introduction, medals and tokens on this page are not shown to scale, but are instead displayed at a standard size. 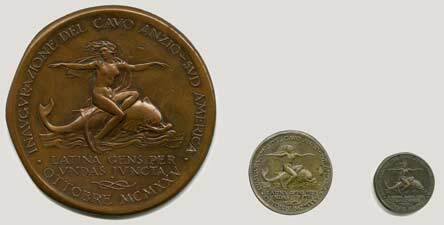 However, this medal has such a range of sizes that I thought it worth a comparison. The image below shows the 85mm bronze, 36mm silver, and 22mm bronze medals to the same scale. 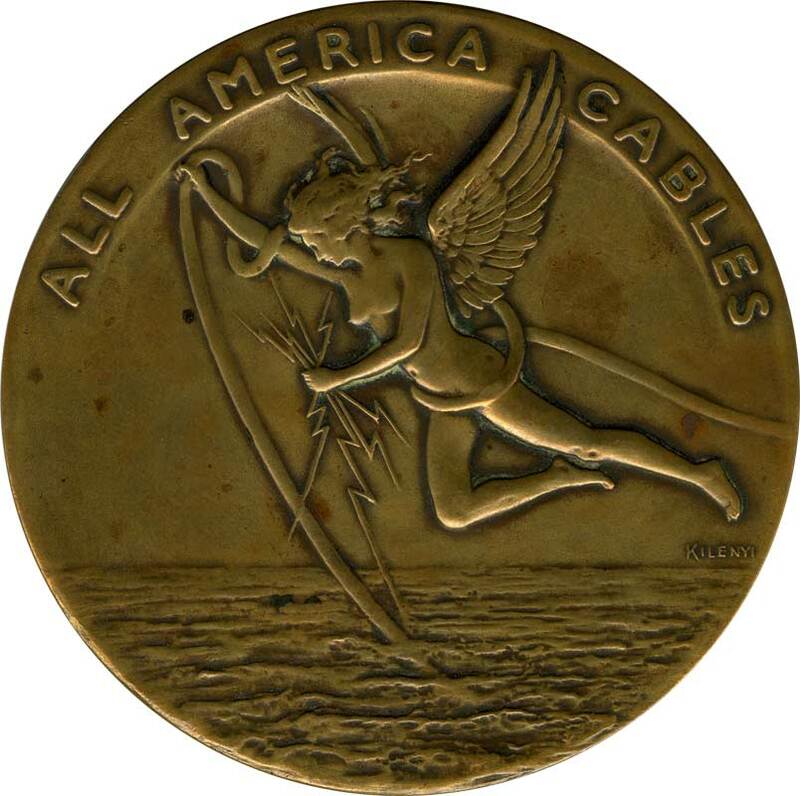 All America Cables, Inc. 50th anniversary medallion, designed by Julio Kilenyi and produced by Whitehead and Hoag. 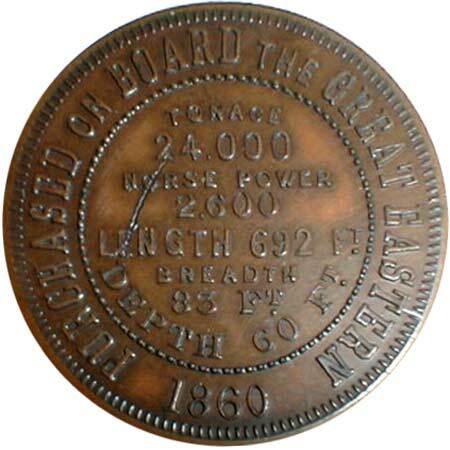 83mm diameter, 212gm. 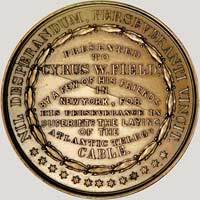 On Tuesday, May 8 , President Merrill called to his office all members of the New York staff and presented each individual with a medallion, commemorating the Fiftieth Anniversary of the founding of All America Cables, Inc. 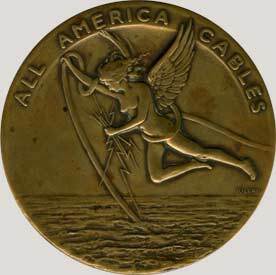 He shook hands with each person and thanked every man and woman for the faithful service he or she had performed for All America Cables. 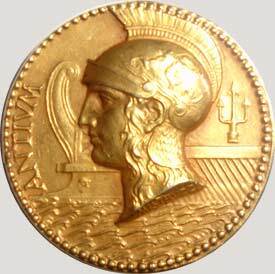 The medallion is a singularly beautiful thing and everybody was impressed by its attractiveness. The design was executed by Mr. Julio Kilenyi, an artist and sculptor of international fame. 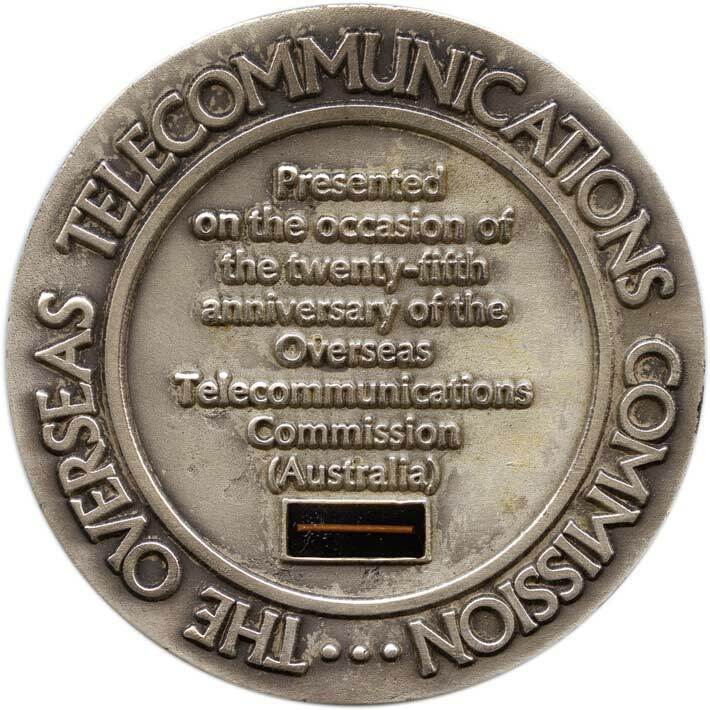 This late 20th century medal commemorates the centenary of the 1866 cable. The maker and exact issue date are presently unknown. 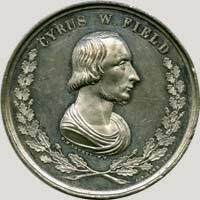 The obverse has a portrait bust of Cyrus Field with a stylized globe behind him. 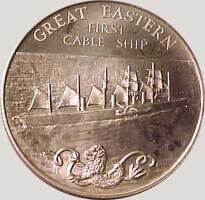 The reverse shows Great Eastern with what appears to be (incorrectly) five funnels, and a sea serpent grasping the cable.. 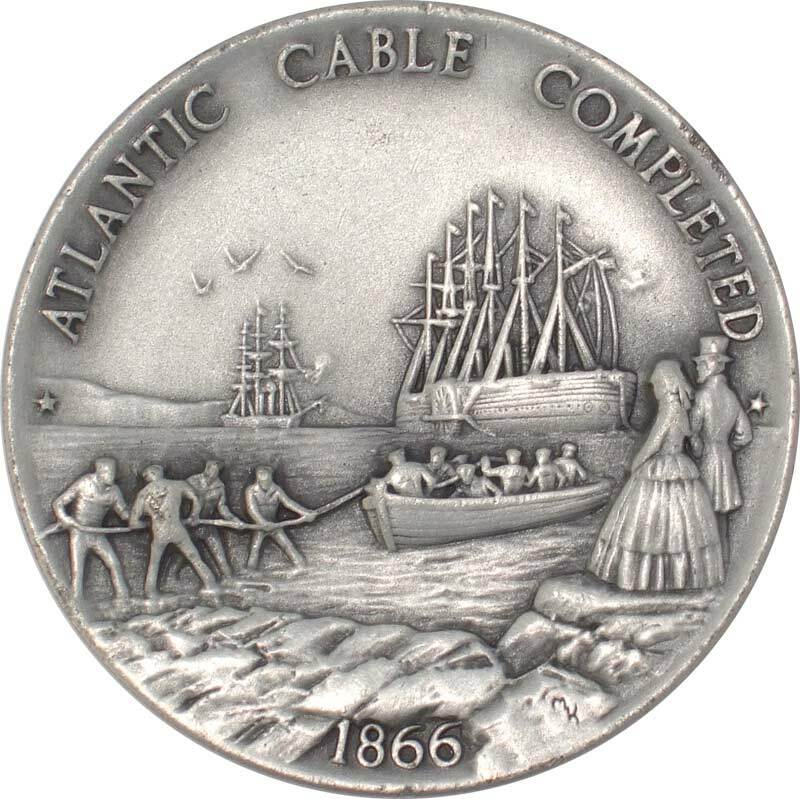 This late 20th century Danbury Mint pewter medal commemorates the completion of the 1866 cable. The exact issue date is presently unknown. The obverse shows the shore end of the cable being landed at Heart’s Content, Newfoundland. 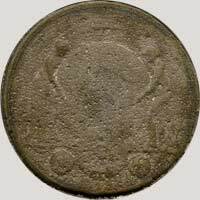 The reverse has the inscription and an eagle above a banner with two stars and the 1866 date, flanked by laurel branches. 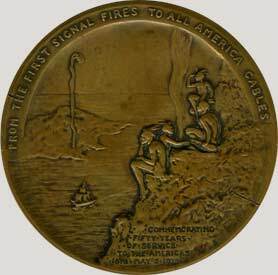 In the inscription, “a matter of seconds” would more accurately be “a matter of minutes”. 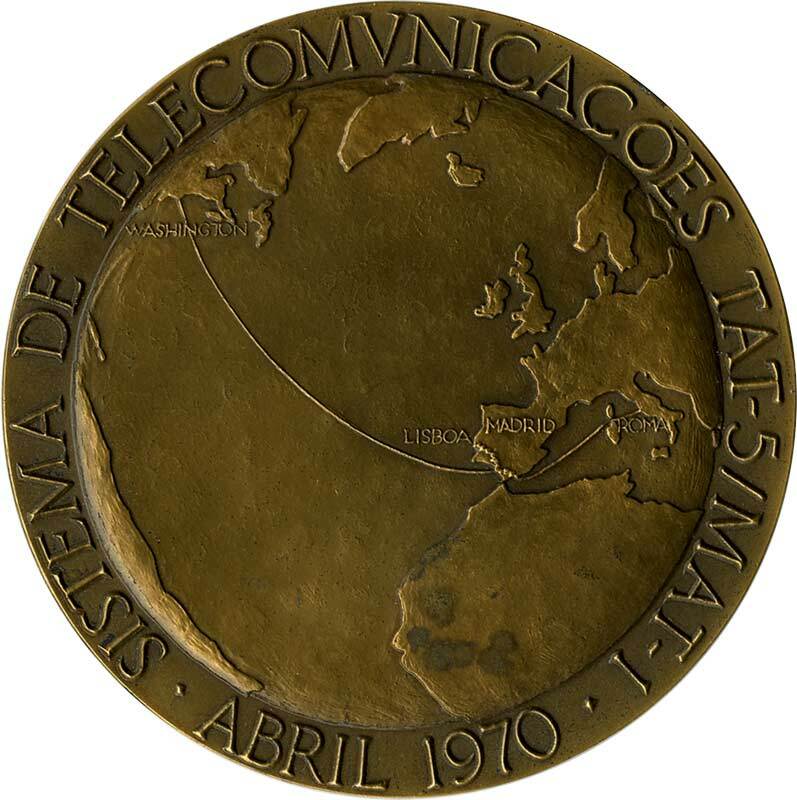 The wording around the edge of the reverse translates as: “From the whole world to the whole world via Portugal,” and the centre wording as: “Submarine cable station Sesimbra inaugurated by his excellency the President of the Republic Americo Thomaz 11-8-1969”. The Portuguese medal shown above below commemorates the 1969 inauguration of the Sesimbra cable station. 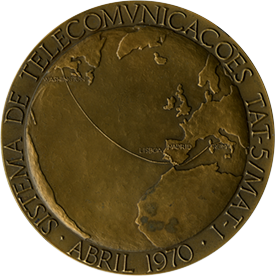 In 1973 a radio link connected Sesimbra to the TAT-5 cable station at Conil, Spain. 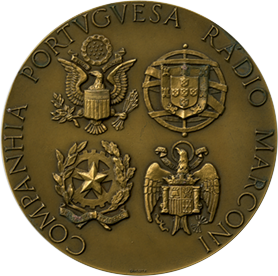 This medal, diameter 80mm, was created by Portuguese sculptor Joao Duarte for Companha Portuguesa Radio Marconi, the Portuguese telecommunications company. The obverse shows the cable route from the USA to Spain, with the ongoing connection to Italy The reverse has the insignia of the country of each of the main partners in the cable. Other partners were ITT World Communications, RCA Global Communications, and Western Union International. 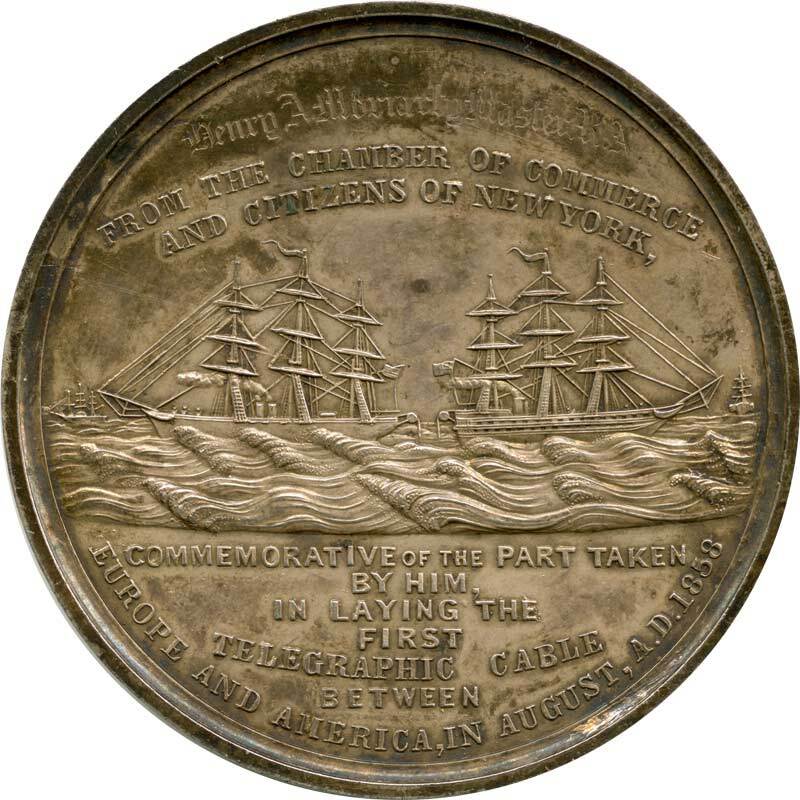 In 1871 the link from Java to Port Darwin completed the first direct undersea cable connection between Australia and Britain, and the medal thus commemorates both old and new telecommunications technology in Australia. Manufactured by Standard Telephones & Cables Ltd., this 1470-mile coaxial telephone cable was laid by CS Alert ((4) and CS John W. Mackay in 1975 for the International Submarine Cable Company Limited. STC also made the 231 bidirectional repeaters, which were spaced at 6.3 nm and provided a bandwidth of 5704 kHz, 1380 voice channels. The system cost was $36.6 million. 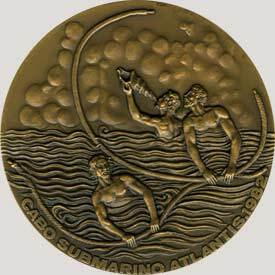 Medal courtesy of David Watson. 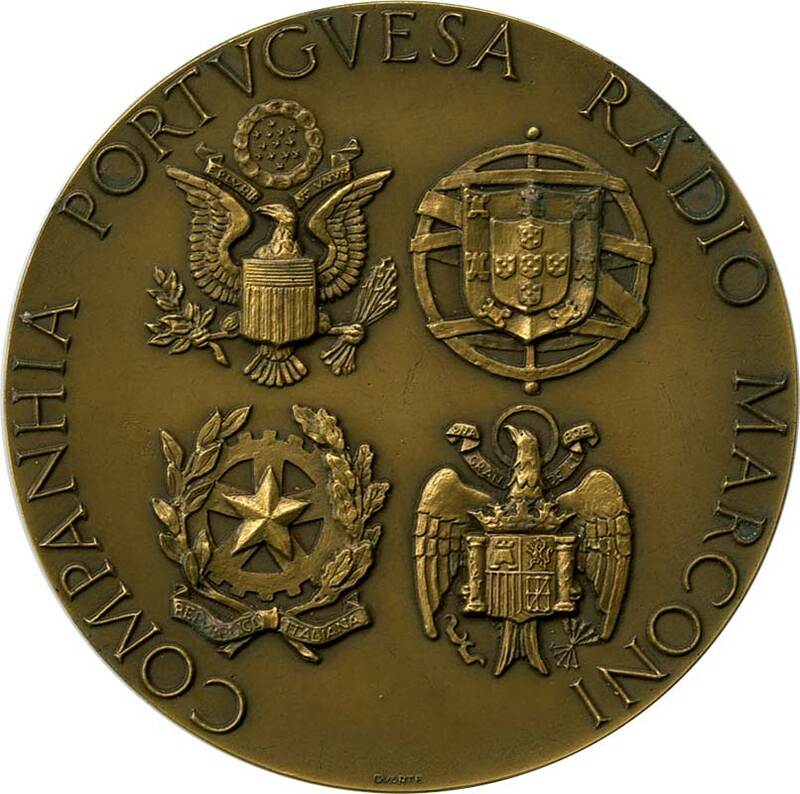 Companhia Portuguesa Rádio Marconi (CPRM) commemorative medallion for Atlantis, laid in 1982 from Brazil to Portugal via Senegal (Recife - Dakar - Burgau). 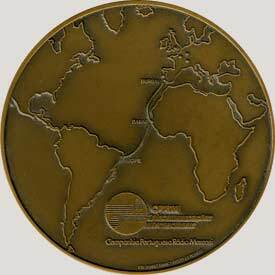 The medal commemorates the completion of section 2 of the cable, between Senegal and Portugal. Section 1: Recife, Brazil - Dakar, Senegal, 1380 x 4kHz channels. Cable manufactured by Standard Telephones & Cables Ltd.	and laid by CS	Cable Venture. for Telesenegal/Embratel. 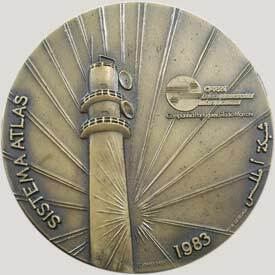 System 1855 nm. 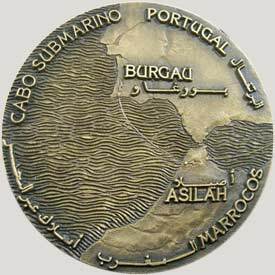 Section 2: Dakar, Senegal - Burgau, Portugal,	2580 x 4 kHz channels. 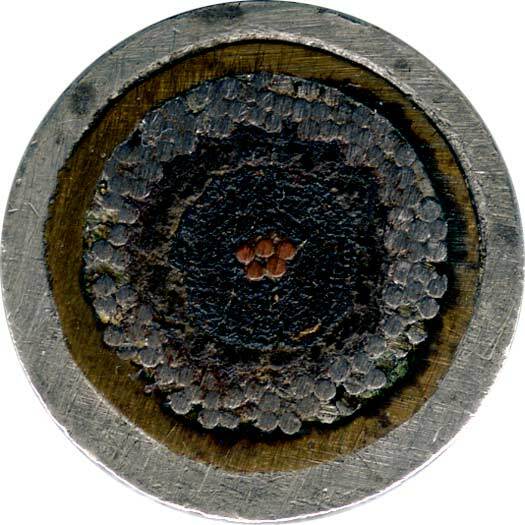 Cable made by Câbles de Lyon; Alcatel manufactured the repeaters. Laid by CS Vercors for CPRM/Embratel. System 1570 nm. 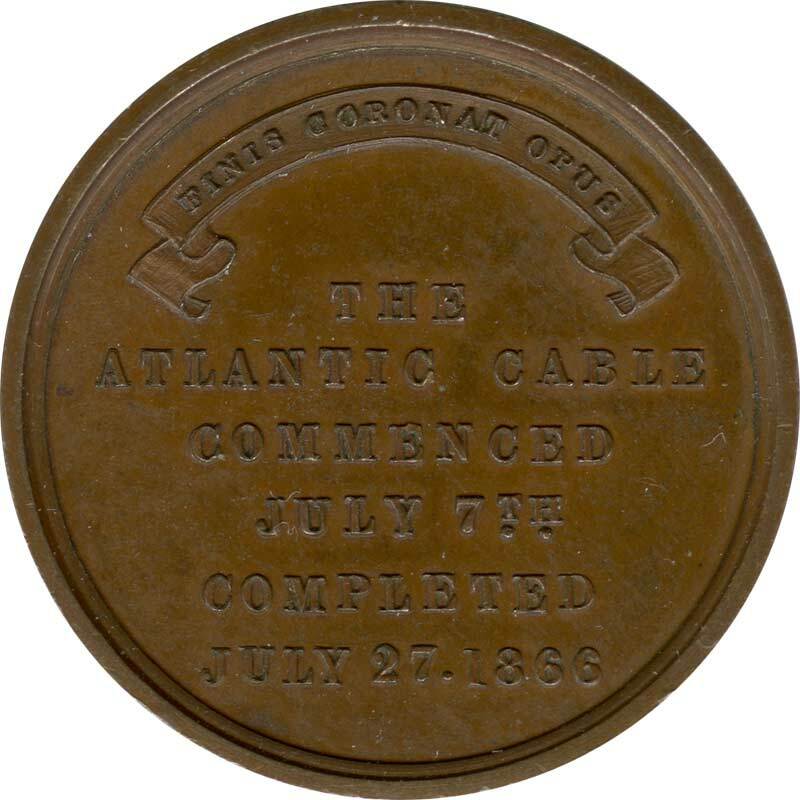 This section of the cable is commemorated by the medal above. Both sections of Atlantis were withdrawn from service in 2000. 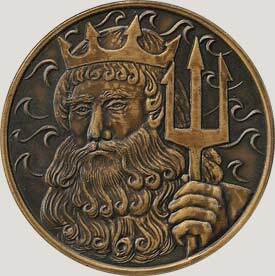 See this page for further information on Atlantis and Atlas. 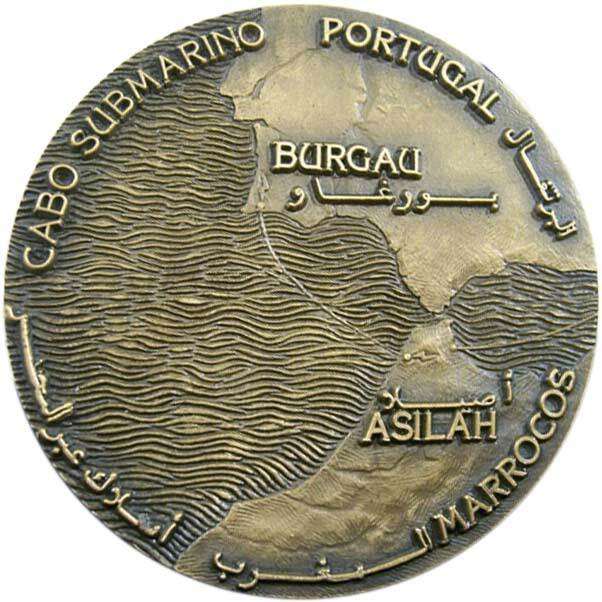 Companhia Portuguesa Rádio Marconi (CPRM) commemorative medallion for Atlas, laid in 1983 from Burgau, Portugal to Arzila, Morocco, by CS Vercors, continuing the route of Atlantis (see above). 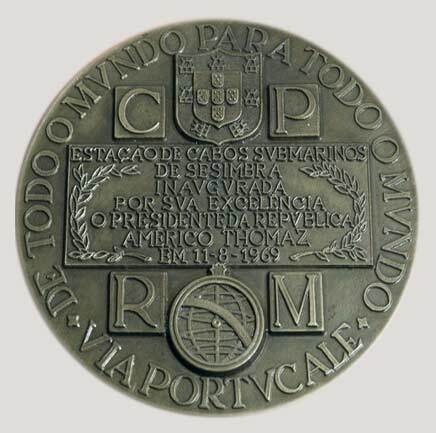 The cable was made by Câbles de Lyon for CPRM - MATELCA; system length was 193 nm. 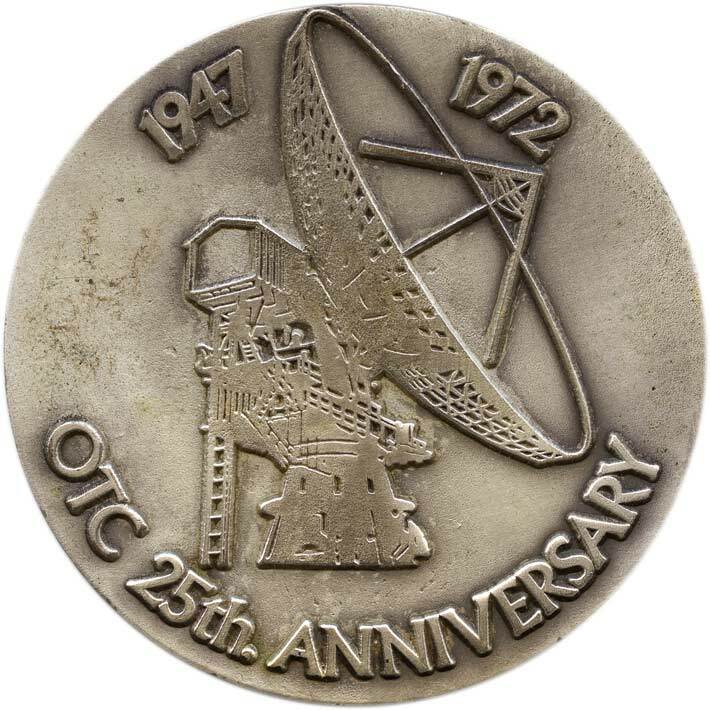 and the cable provided 1260 x 4kHz channels. 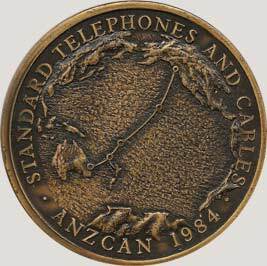 STC Commemorative Medallion for ANZCAN. 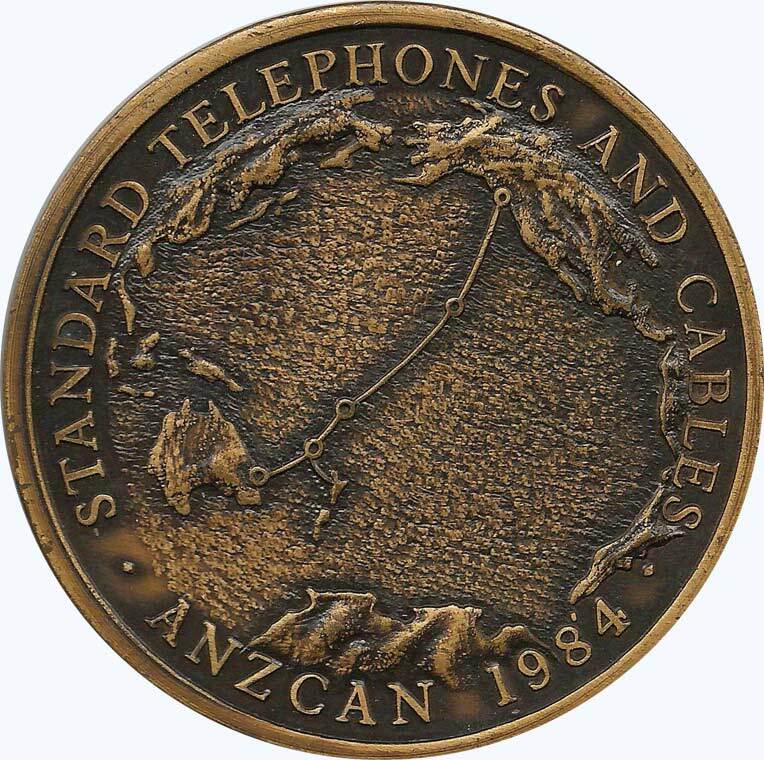 Laid in 1984 as a replacement for COMPAC, ANZCAN followed the same route from Australia and New Zealand to Canada, with the addition of a landing at Norfolk Island. 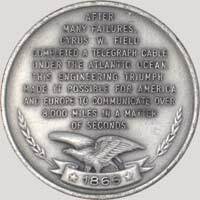 The cable was 8,250 nm long, with 1,213 repeaters and a capacity of 1,380 telephone circuits. Screw, Paddle and Sail. Four Decks. 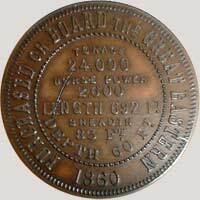 Undated British token, maker unknown. Issued in 1860 as a souvenir of the Great Eastern’s first voyage to New York. Several designs of token were produced that year in copper, brass, and white metal, most of them by George H. Lovett. 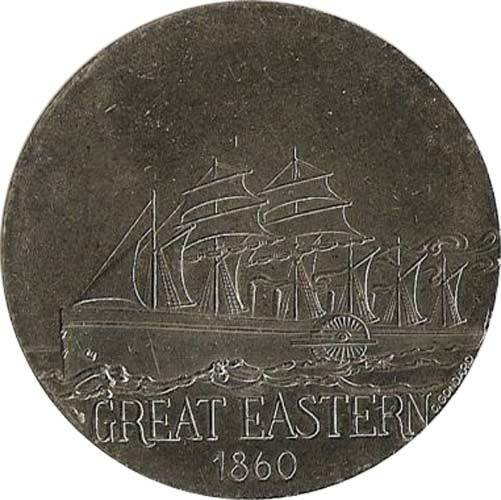 Further information on these Great Eastern pieces may be found at the Lovett Tokens & Medals website. Also issued in 1860 as a souvenir of the Great Eastern’s first voyage to New York, the following token is larger than the others, at 42mm. 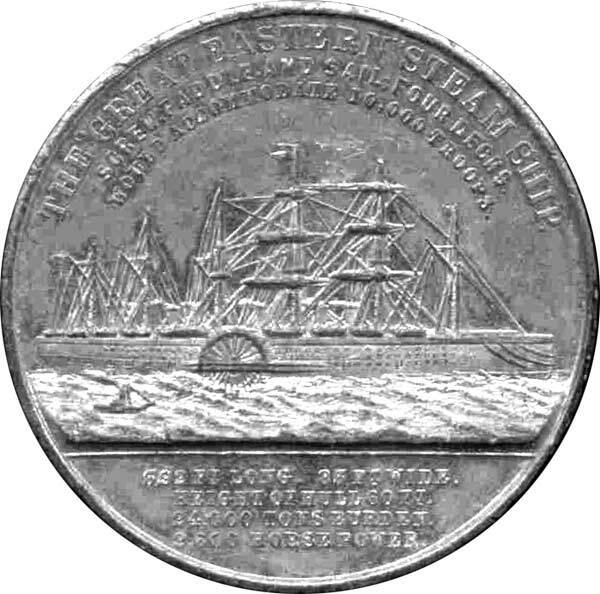 This is not identified as made by Lovett; note the differences in the image of the ship, the wording, and the statistics. Depth of Hull 83 Ft. This 33mm 1861 token is also unidentified; note the differences in the statistics and the image of the ship, and the odd punctuation..
After her final cable voyage in 1874 the Great Eastern fell into dire straits. 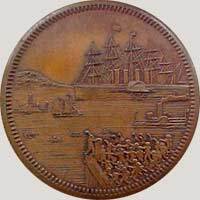 In 1885 the High Court of Justice ordered the ship to be auctioned and the date was set for 28 October of that year. 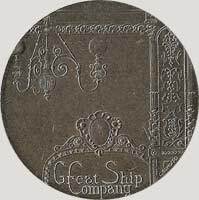 Louis S. Cohen, Managing Director of Lewis’s Department Store in Liverpool, made a private offer of £20,000 for the ship, but this was rejected by the mortgagees and the auction took place under the watchful eye of Mr. Justice Chitty. The first offer was £10,000 and it gradually rose to the final bid of £26,200 offered by Edward de Mattos, the representative of London Traders Ltd. This company intended to load the ship with coal, sail it to Gibraltar, and use it as a coal hulk. 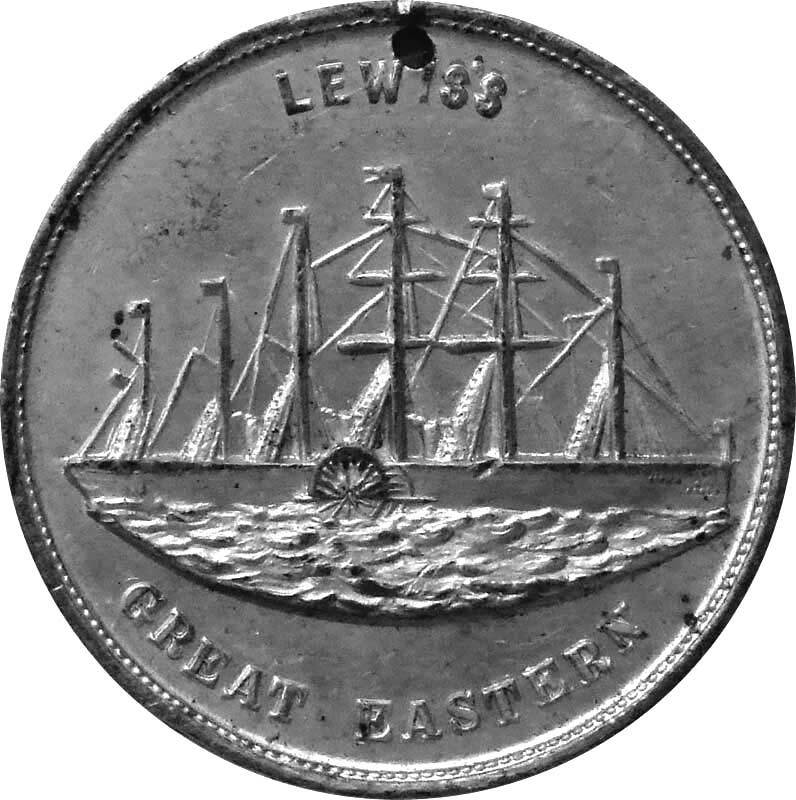 Cohen, having failed to purchase the Great Eastern, offered to charter the ship for a year on condition that it was made available for the Liverpool Exhibition of Navigation, Travelling, Commerce and Manufactures to be held in 1886. 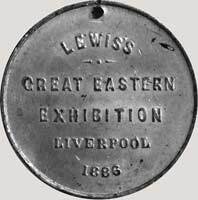 The exhibition was duly held, and these tokens were issued as souvenirs of a visit to the Great Eastern. The tokens were also made in brass. 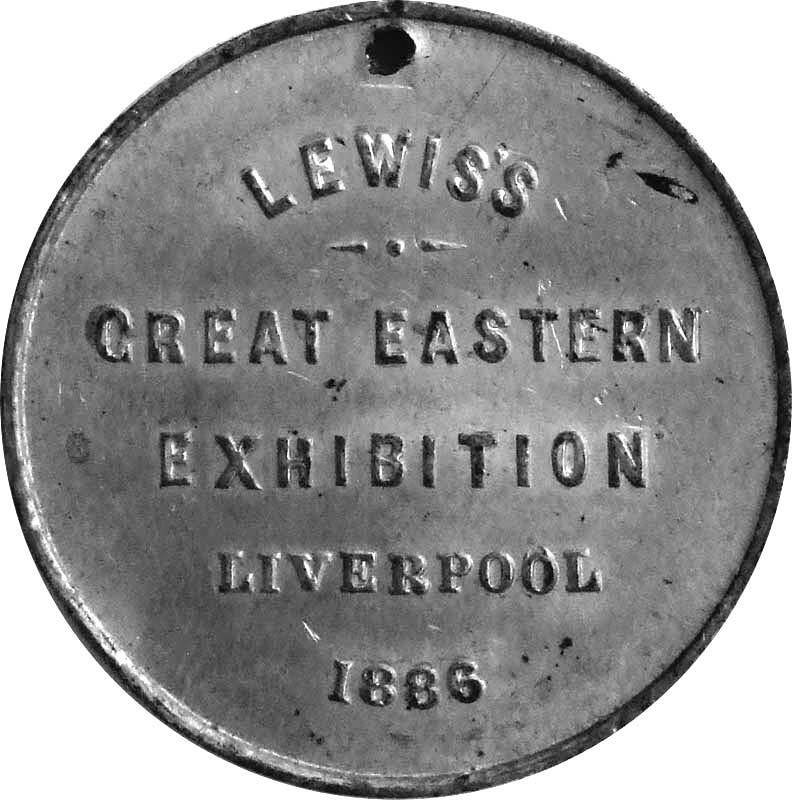 chartered for Lewis’s Great Eastern Exhibition Co.
Bill Glover’s complete story of the Great Eastern may be found on this page, and details of the Exhibition are here. 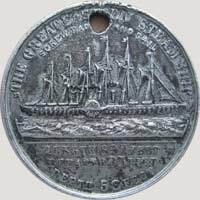 A modern medal designed and produced in France by the Paris Mint, this is one of a series featuring great ocean liners. The engraver, Claude Gondard (1944- ), was trained as an engineer and studied at the École Polytechnique and the École Nationale Supérieure du Génie Maritime. 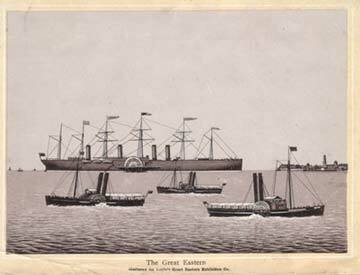 Although the illustration is dated 1860, the ship is shown with only four funnels. The fifth funnel was not removed until 1865, when Great Eastern was converted for cable laying. See the Broadsides page for illustrations of the ship in both configurations.